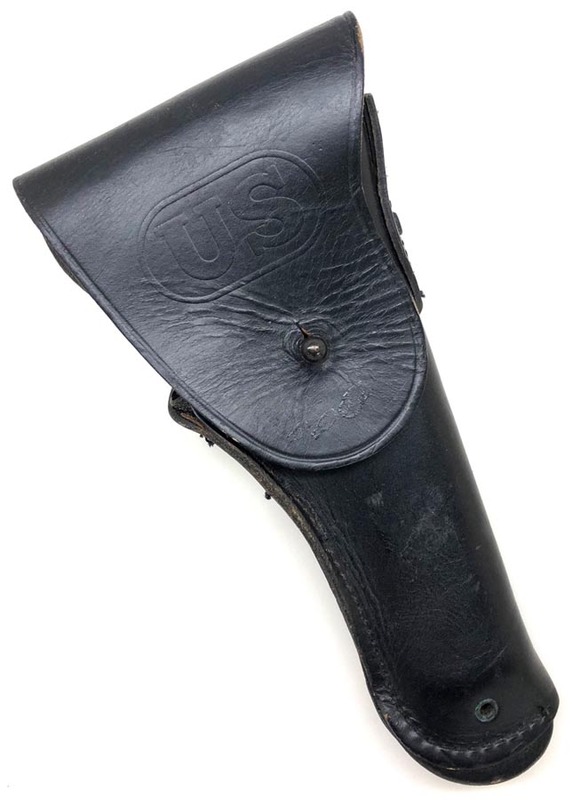 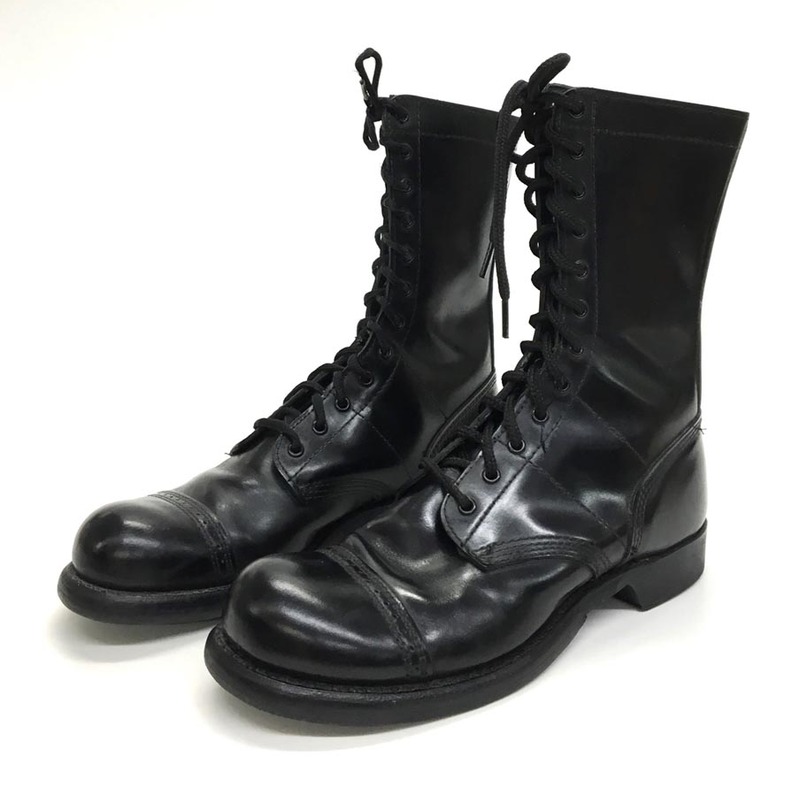 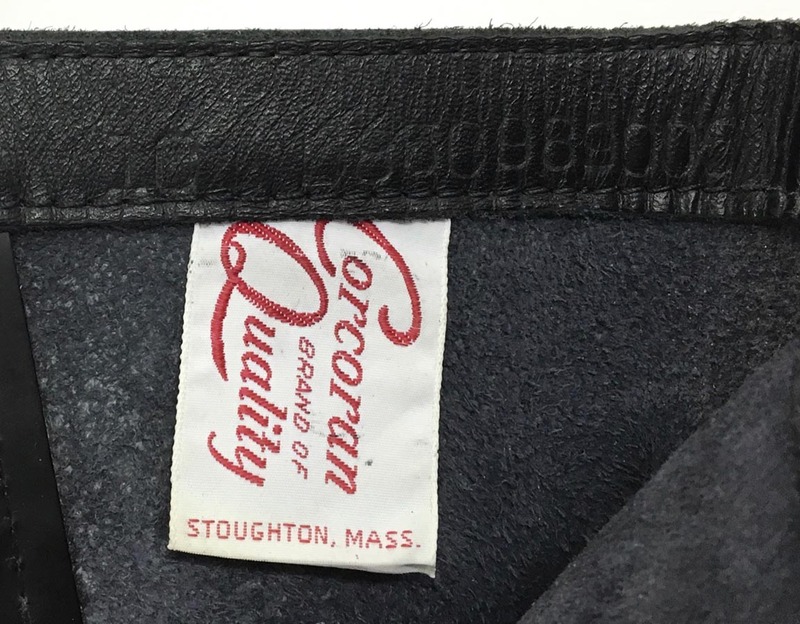 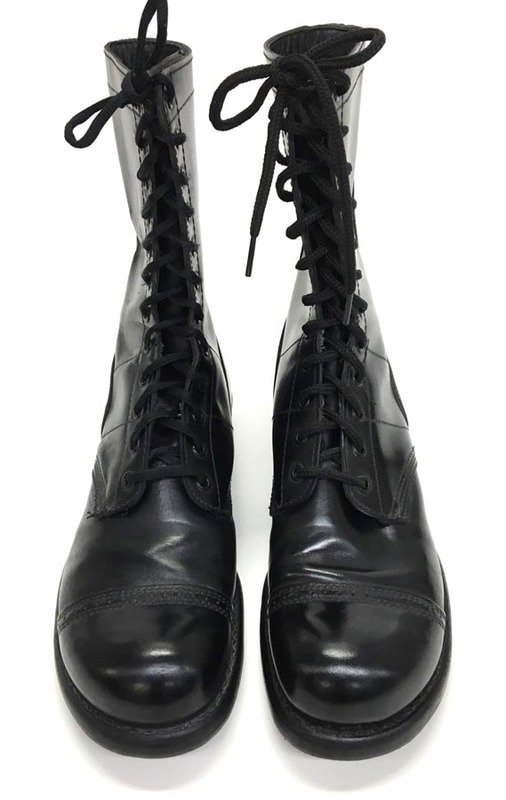 PHYSICAL DESCRIPTION: These Corcoran Jump boots are in excellent unissued condition. 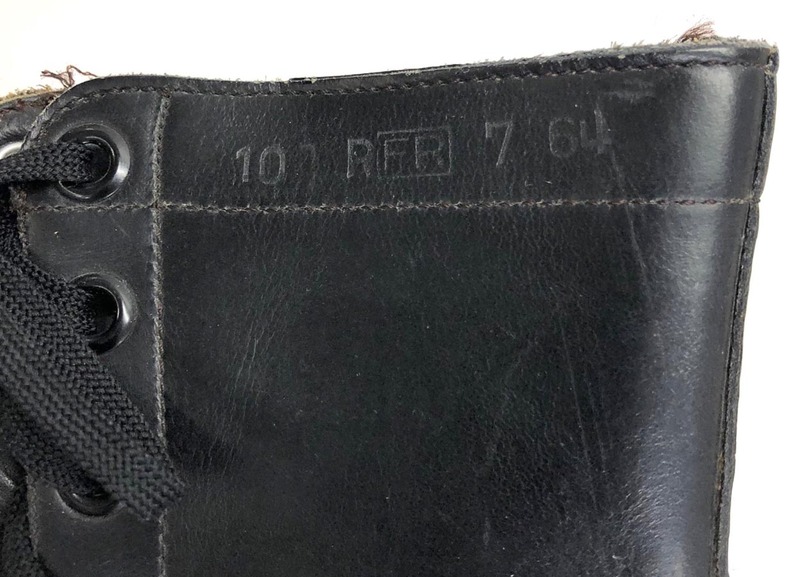 Boots are a size 10. 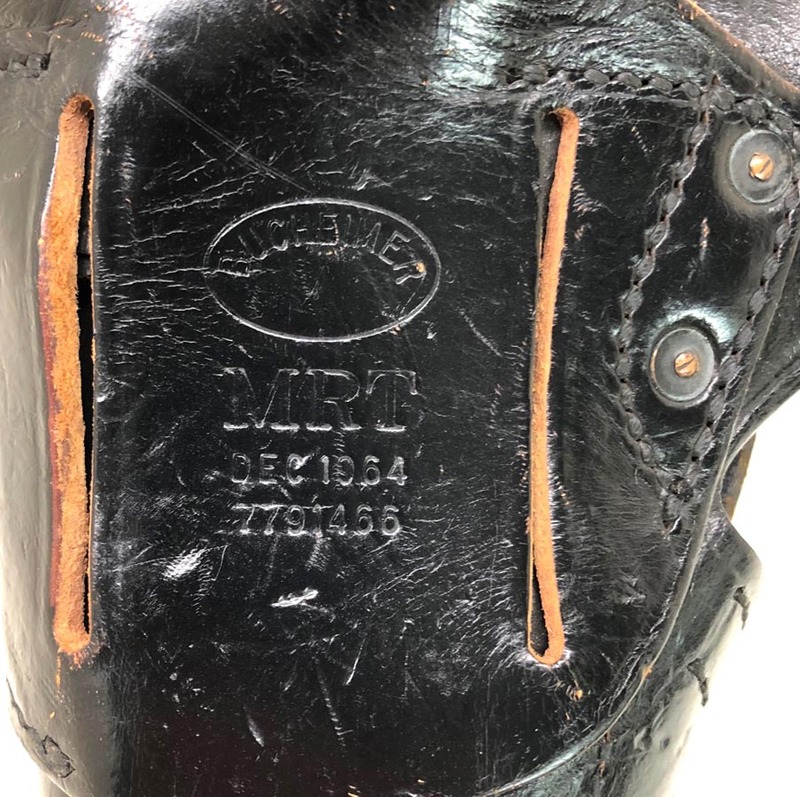 The right lace was missing so a new one was added. 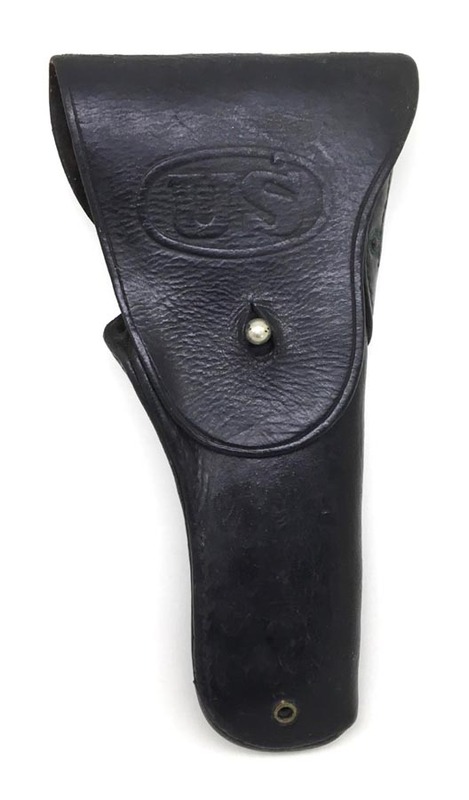 It's a little shorter and slimmer than the original. 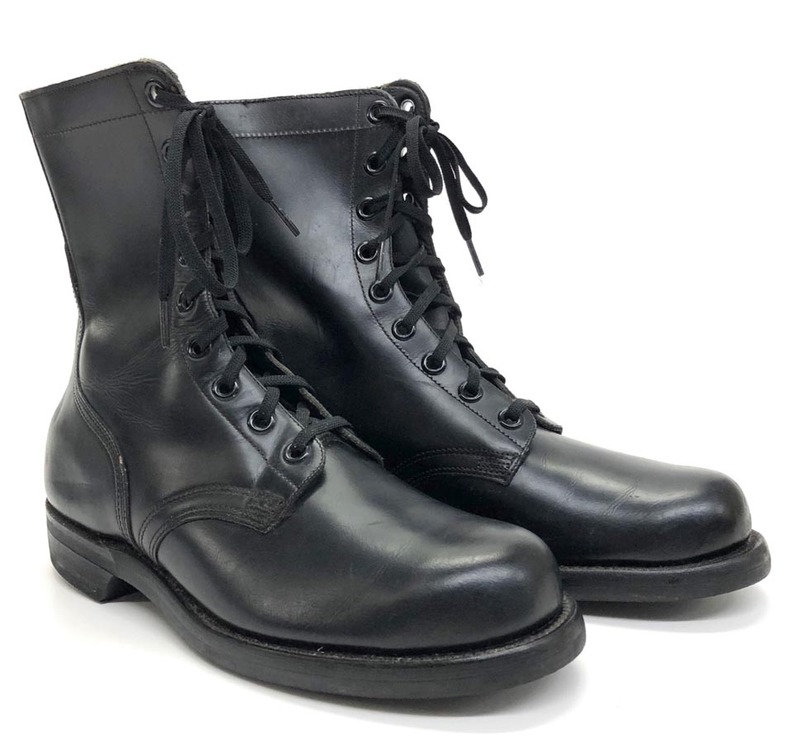 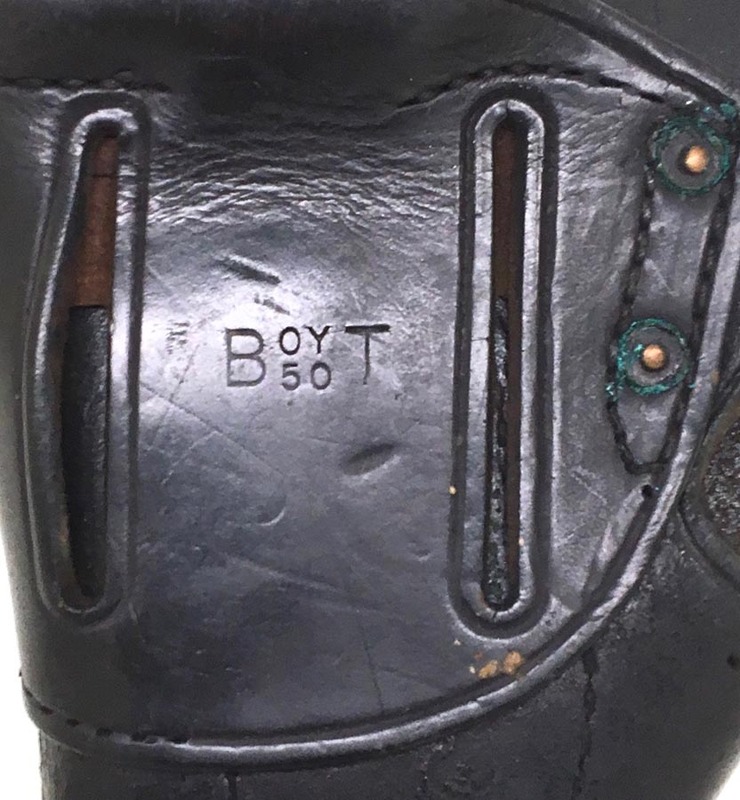 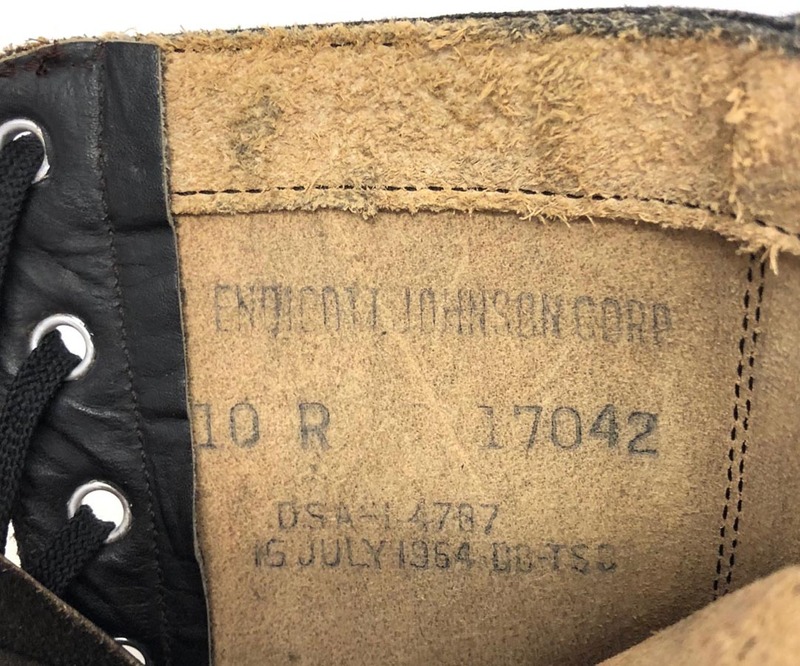 Boots have 12 eyelets and a cut back heel. 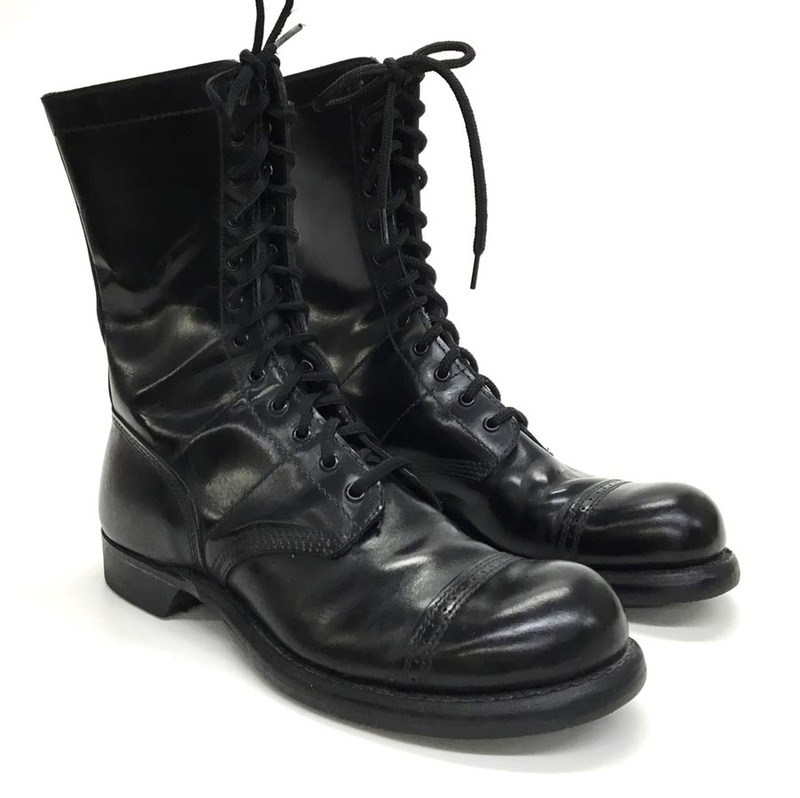 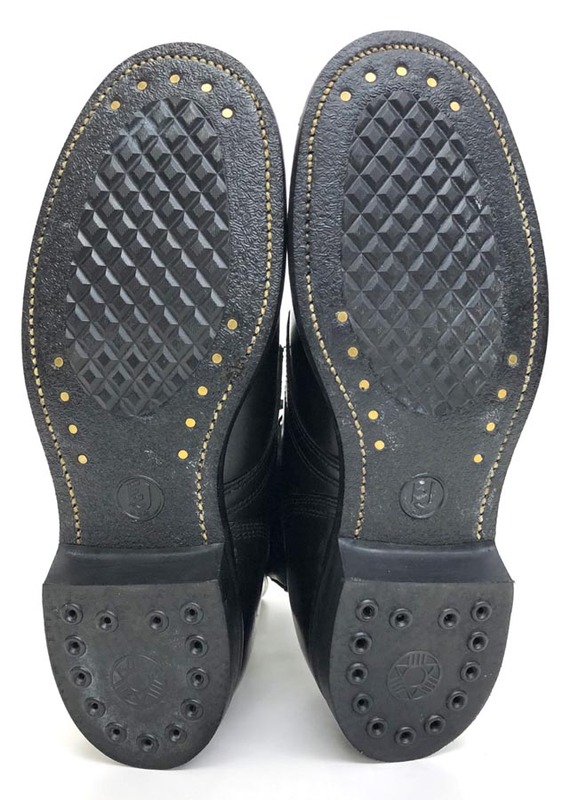 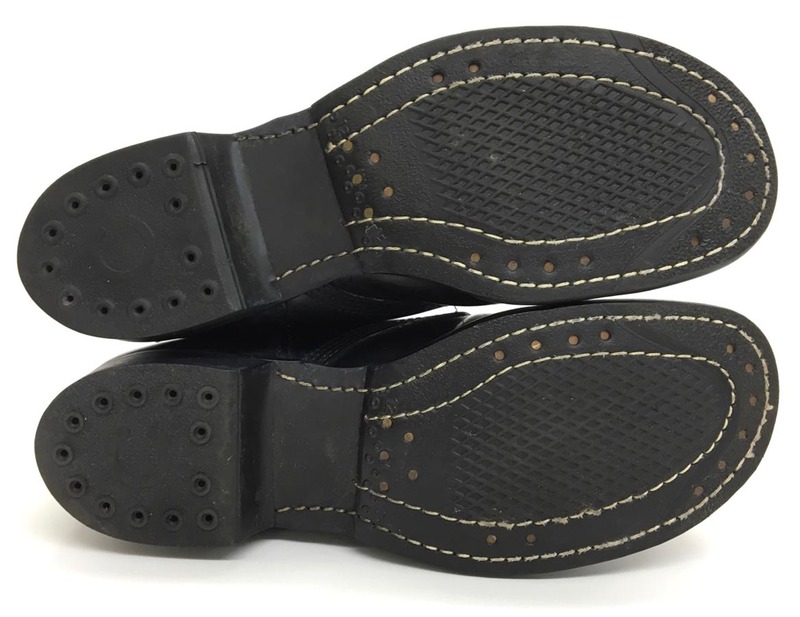 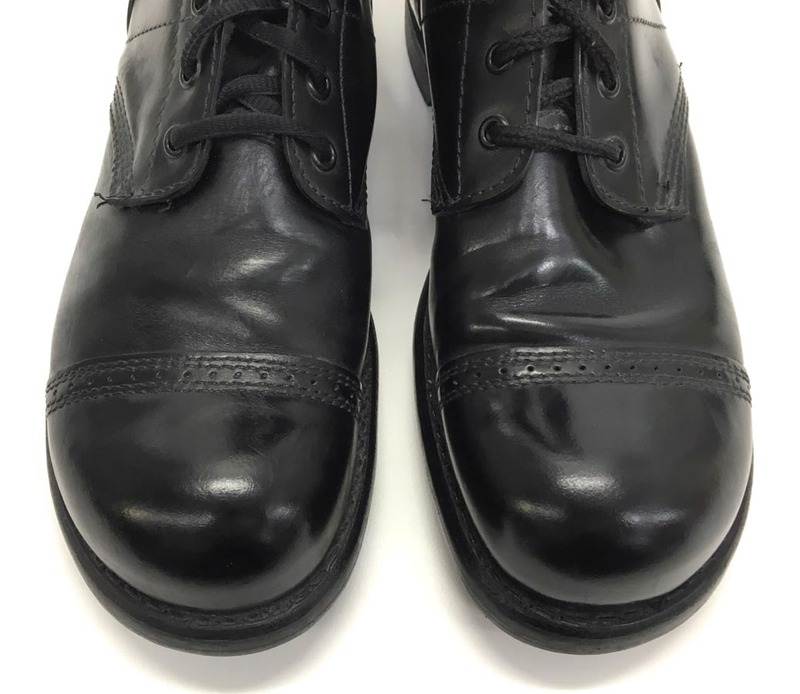 Boots are size marked to the top edge of both boots and to the interior instep. 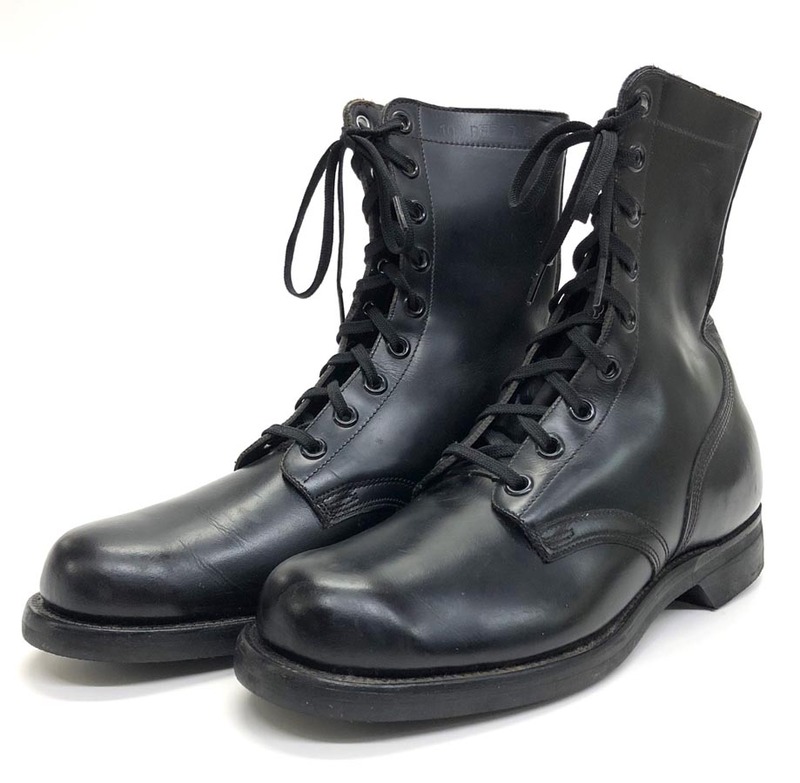 Great pair that would be hard to upgrade. 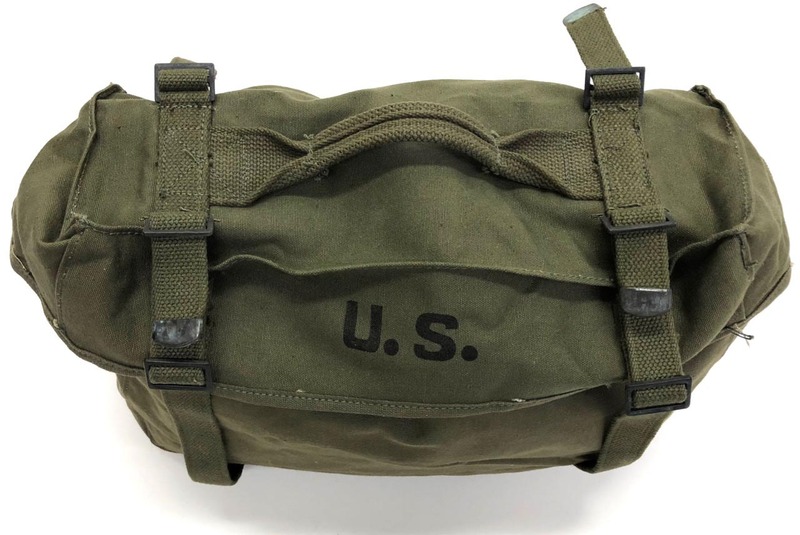 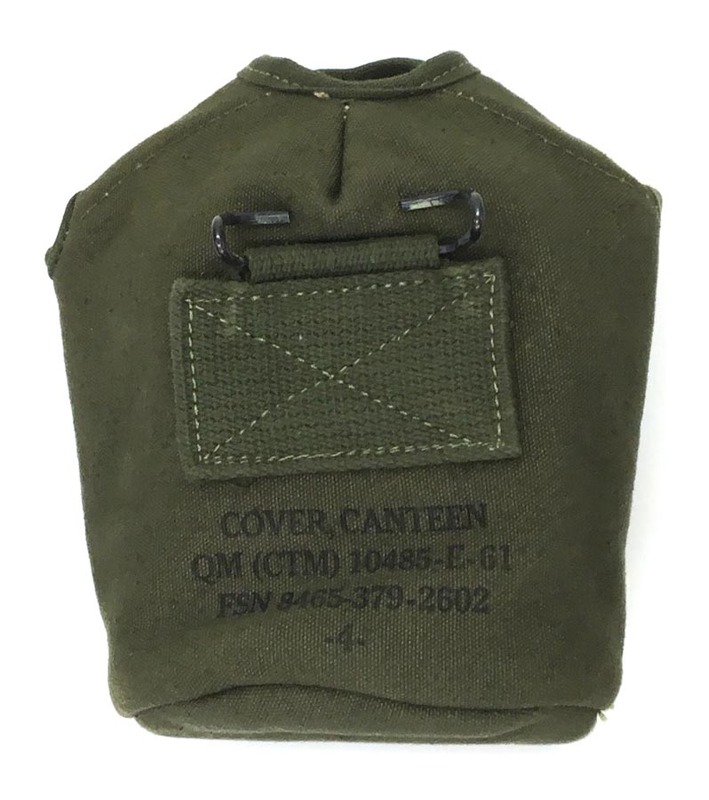 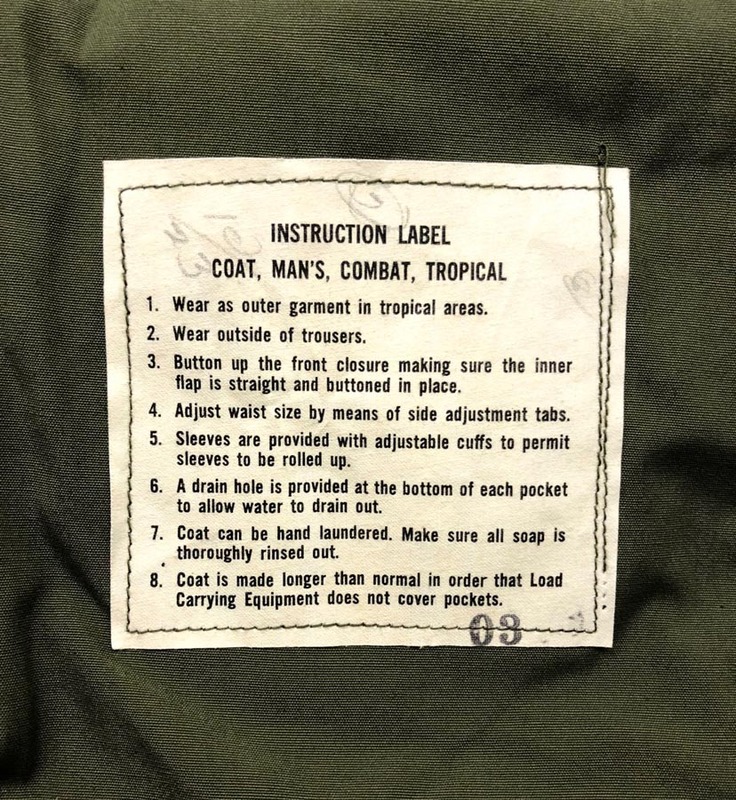 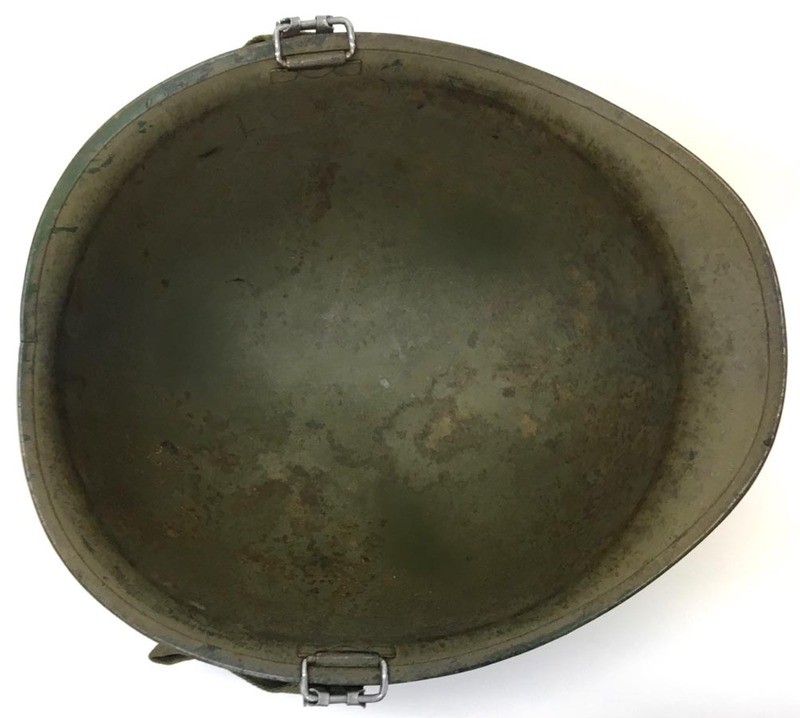 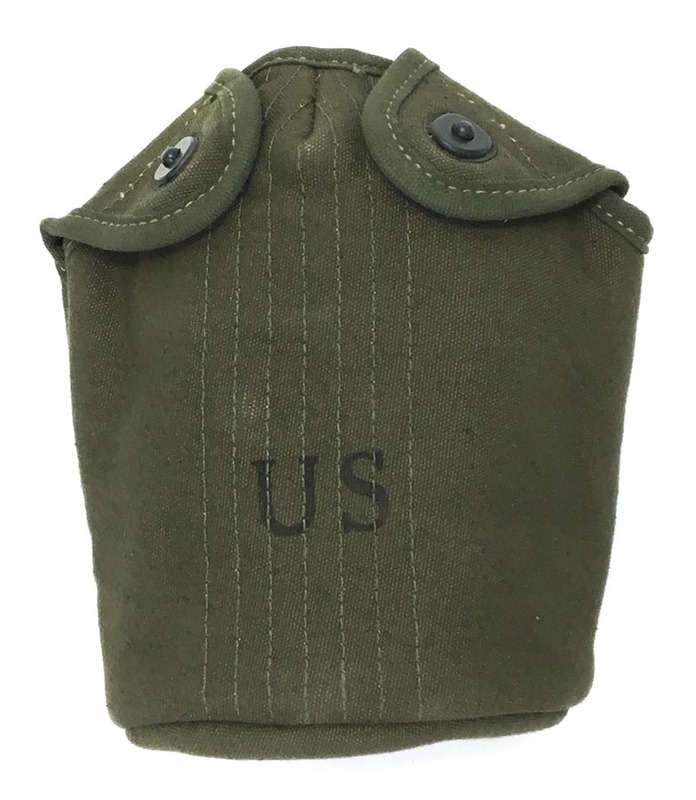 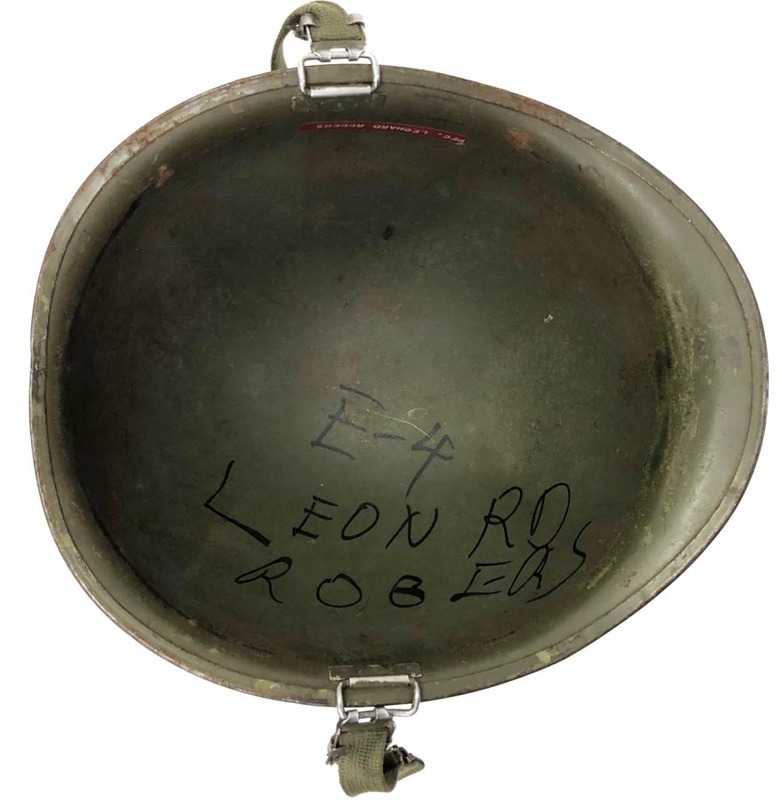 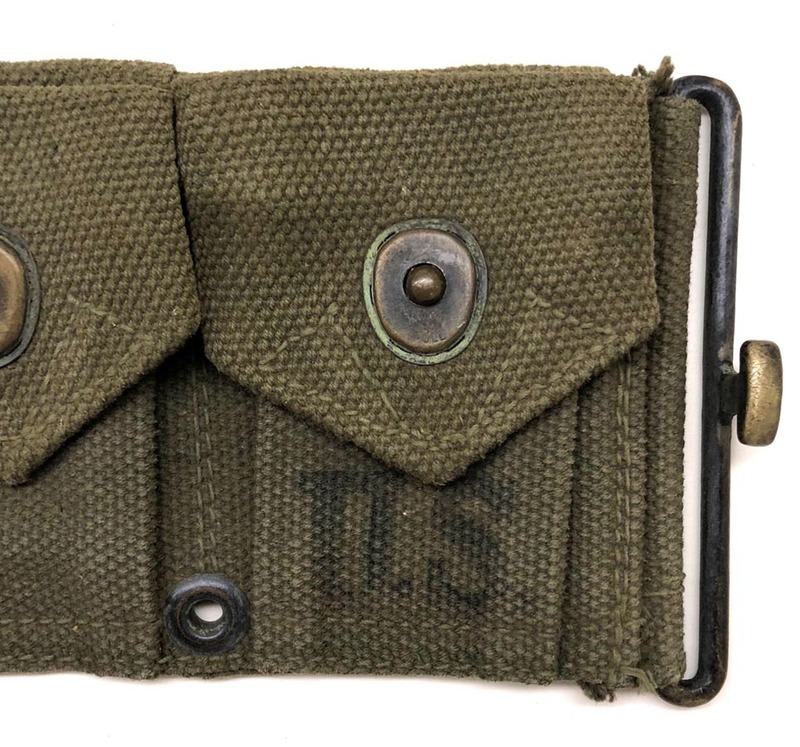 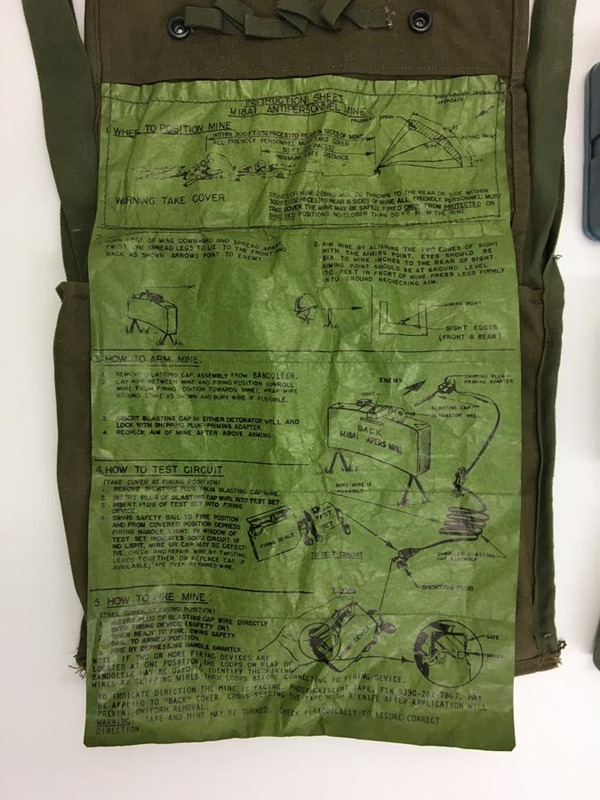 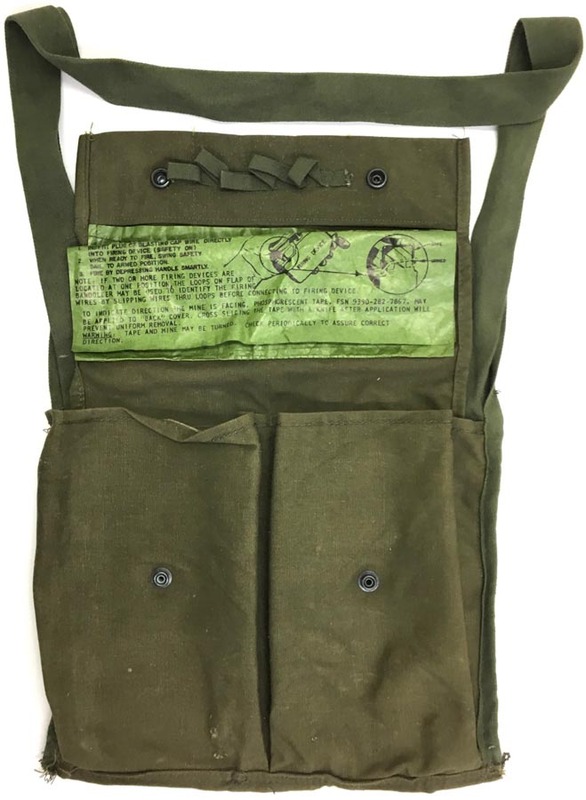 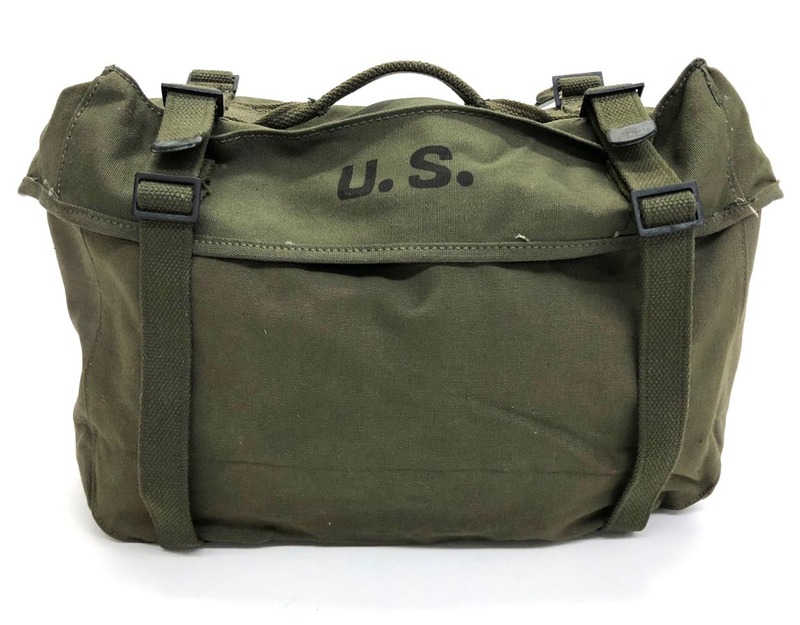 PHYSICAL DESCRIPTION: This canteen cover is in mint unissued condition. 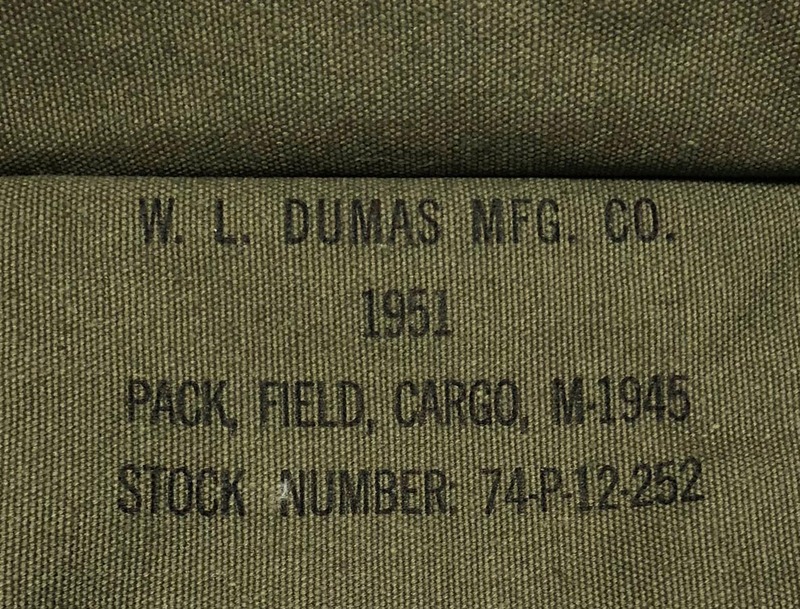 Cover is 1961 dated. 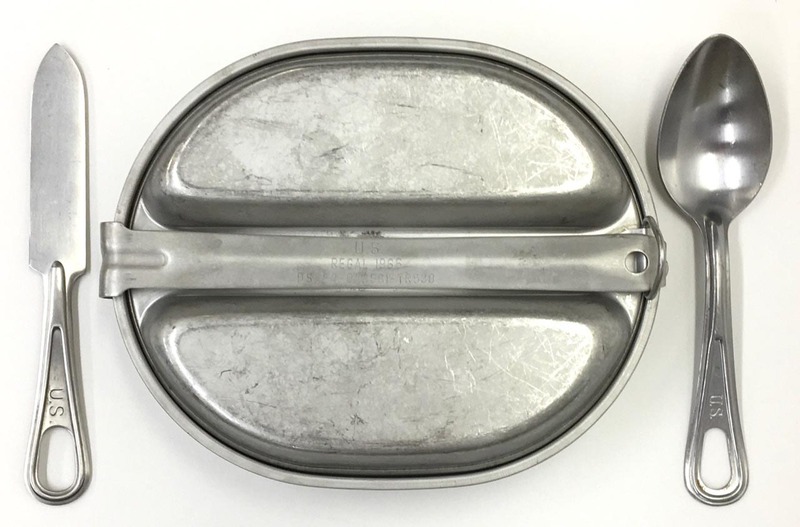 PHYSICAL DESCRIPTION: Vietnam era mess kit and utensils are in great condition with no dents or damage. 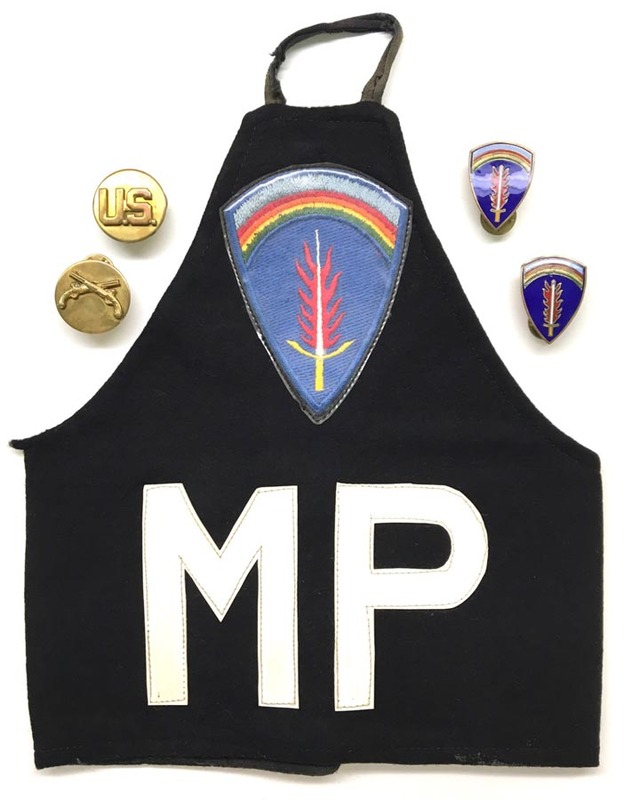 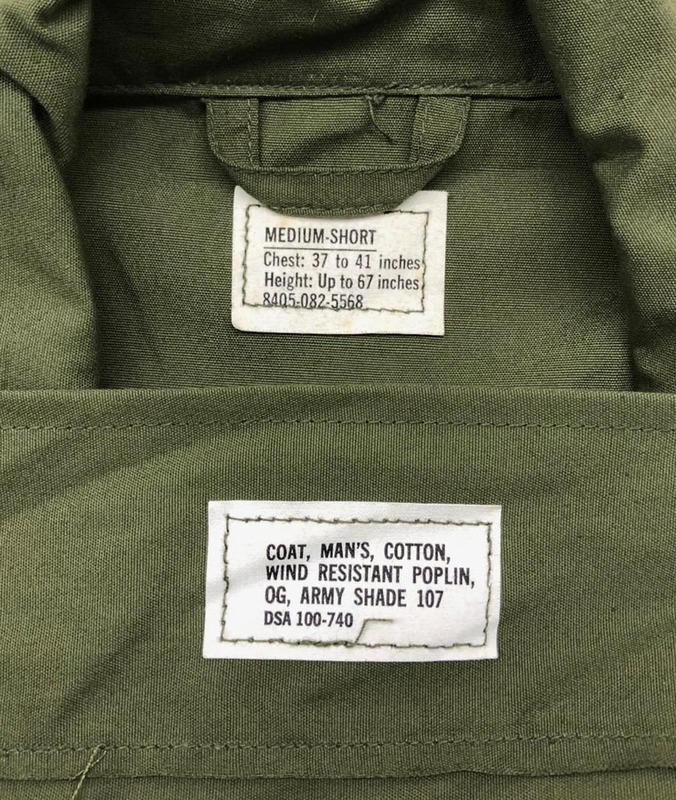 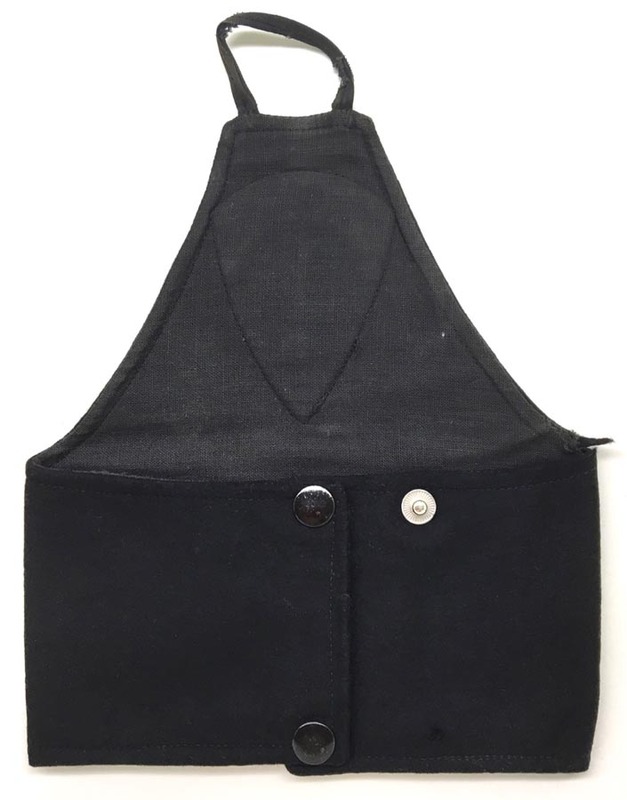 Mess kit is 1966 dated. 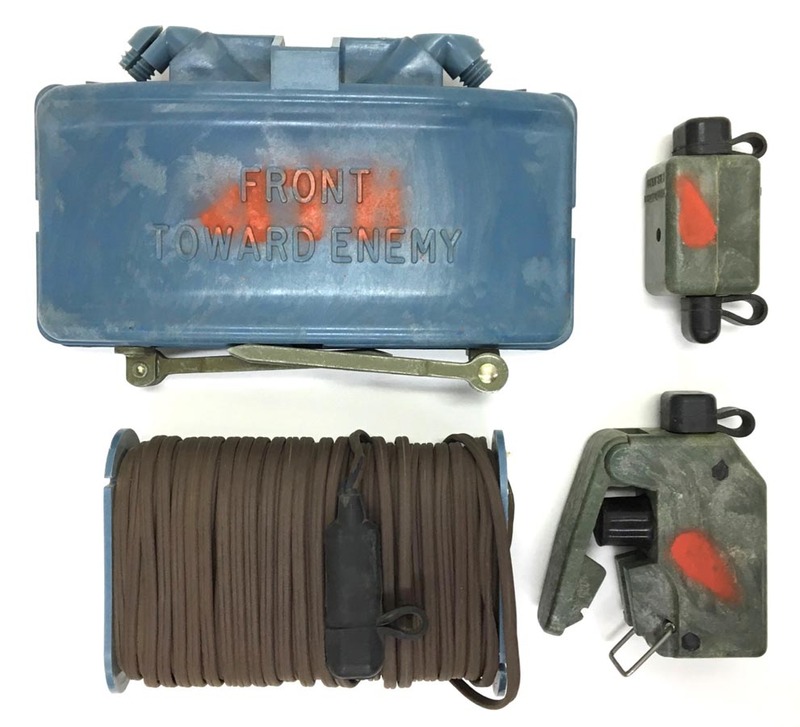 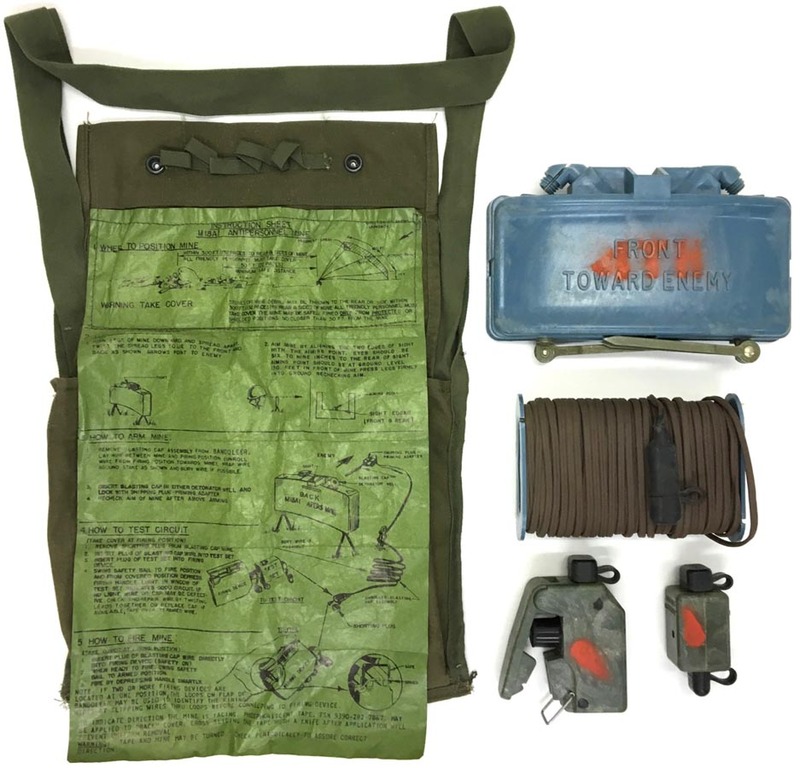 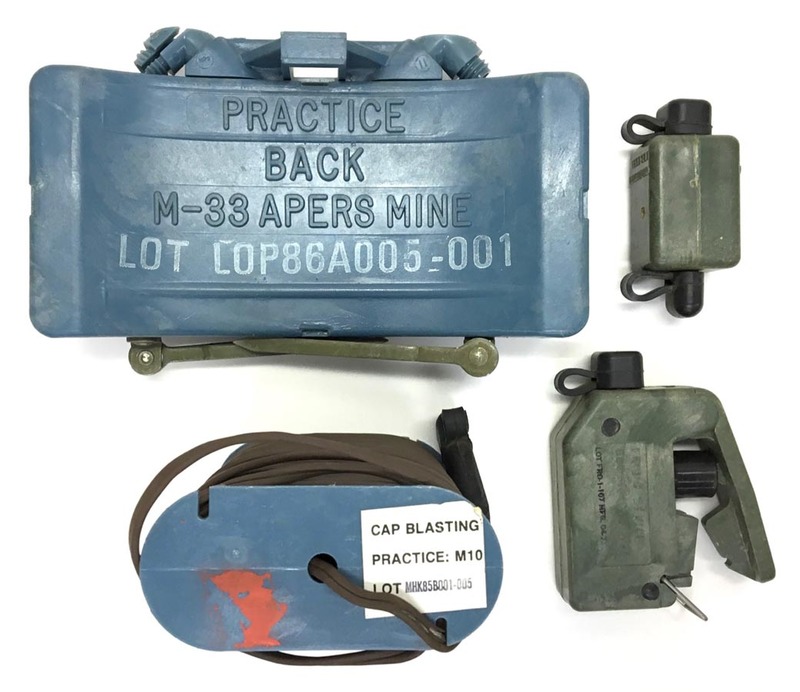 PHYSICAL DESCRIPTION: This Vietnam Era Claymore Training Mine is in real nice condition. 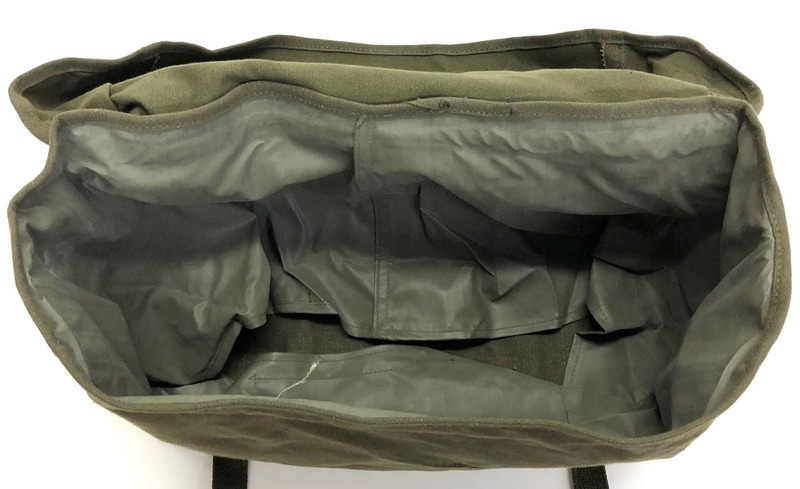 Bag shows some light storage wear. 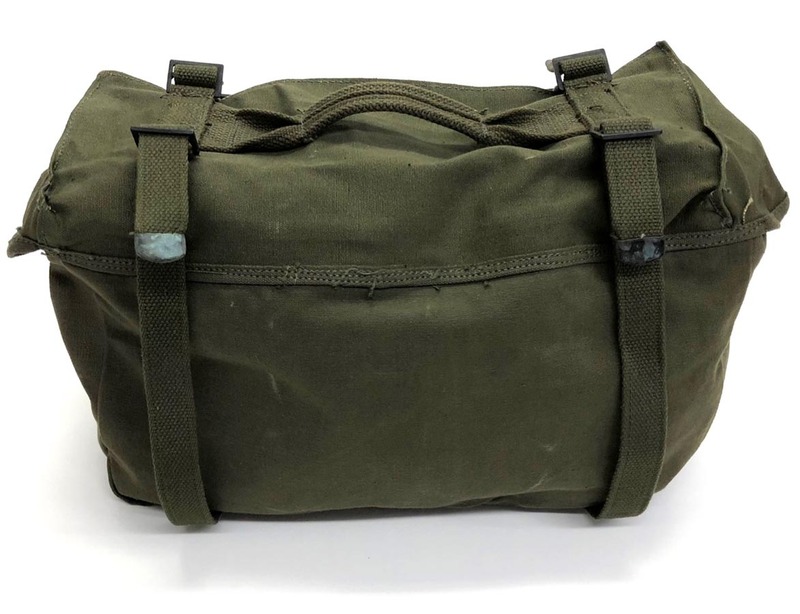 Snaps to bag function great. 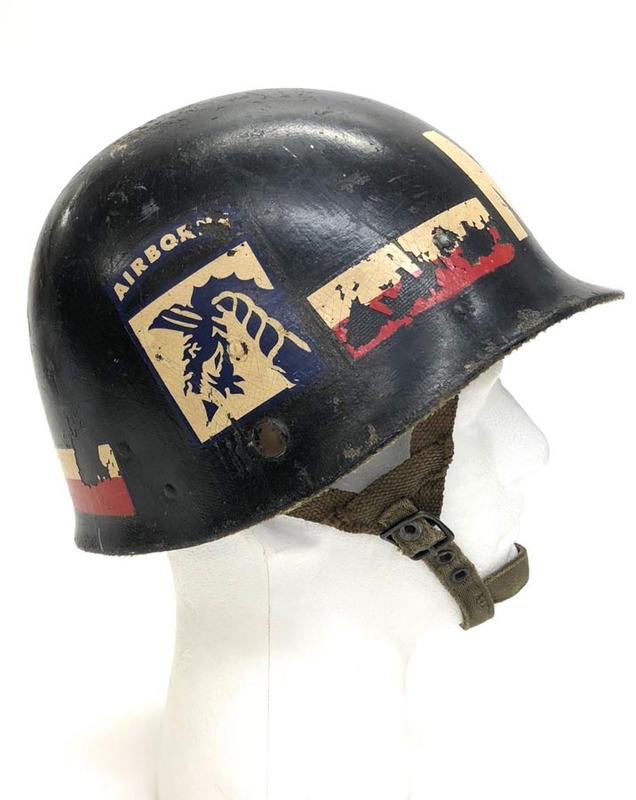 All other items are in excellent condition. 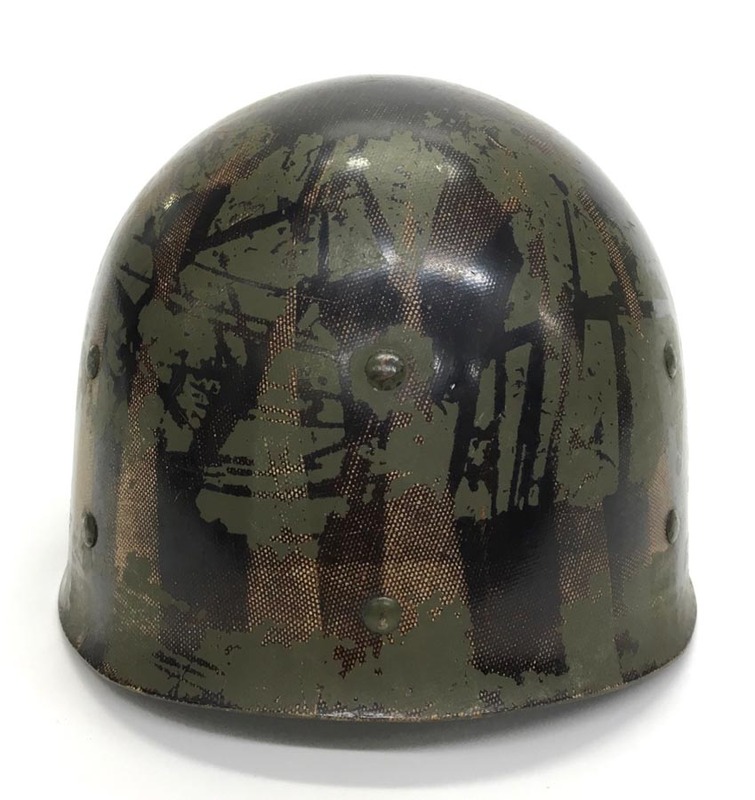 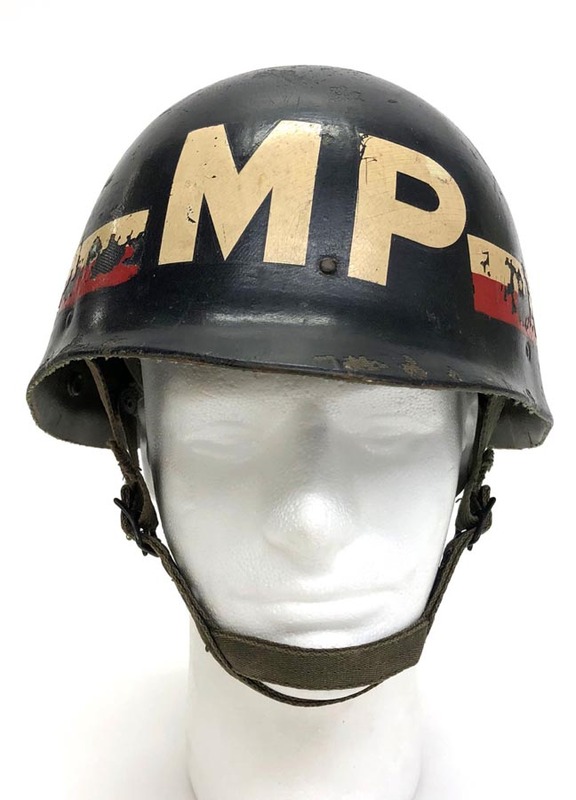 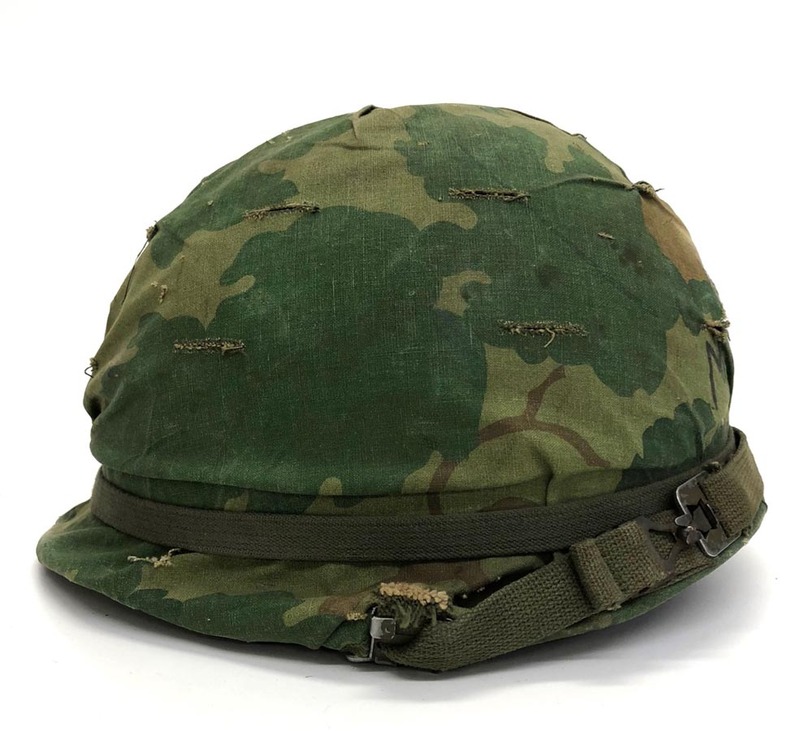 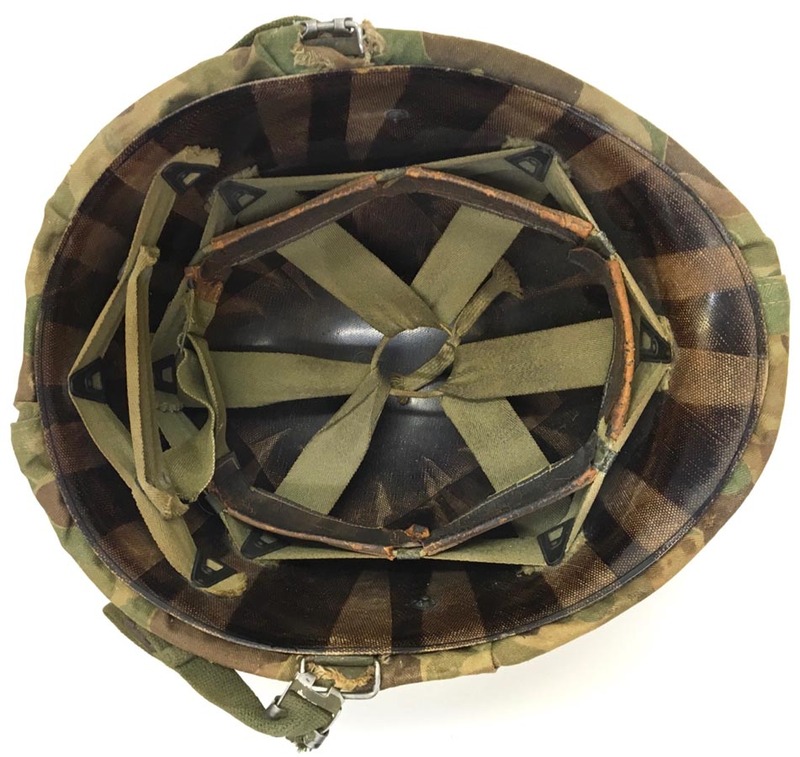 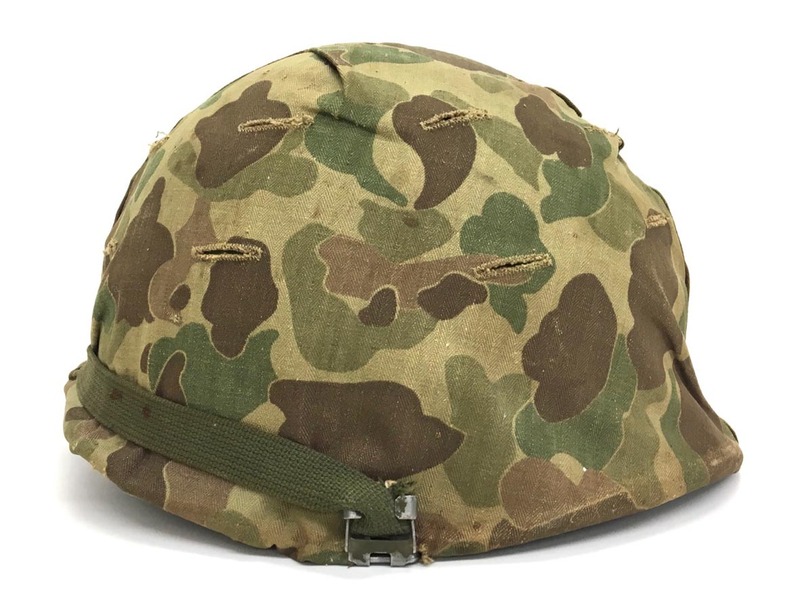 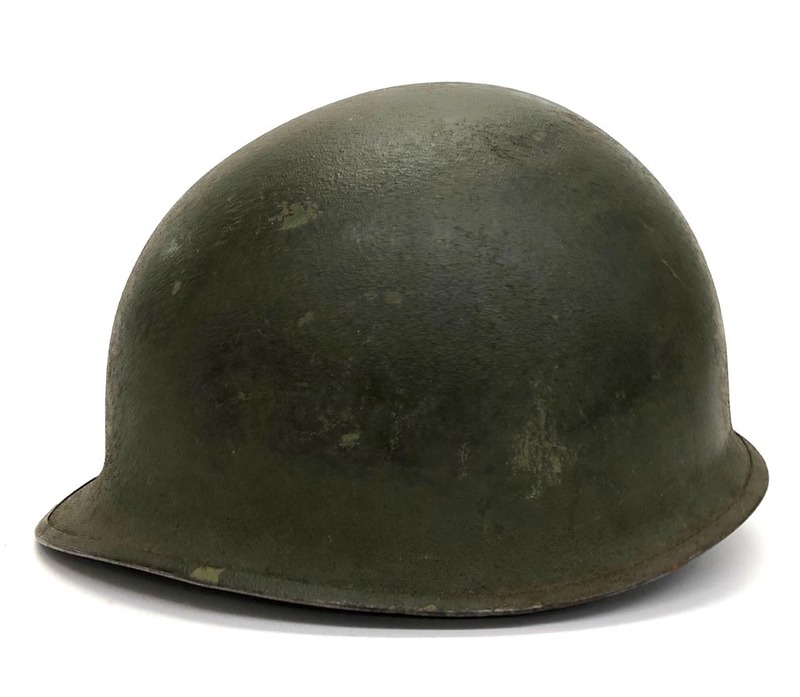 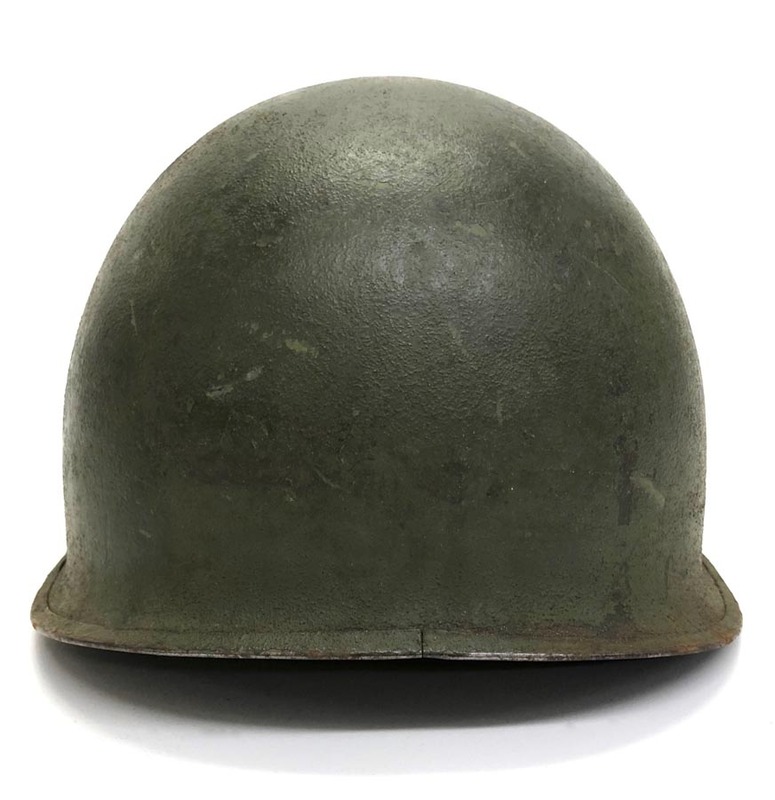 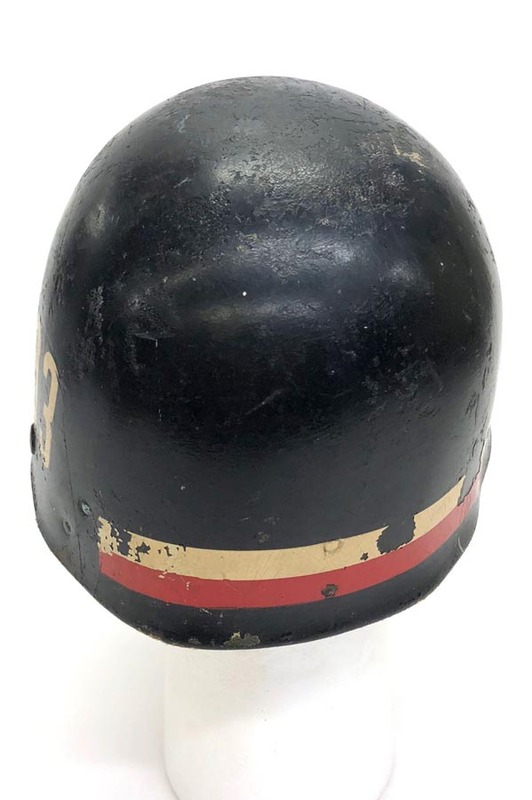 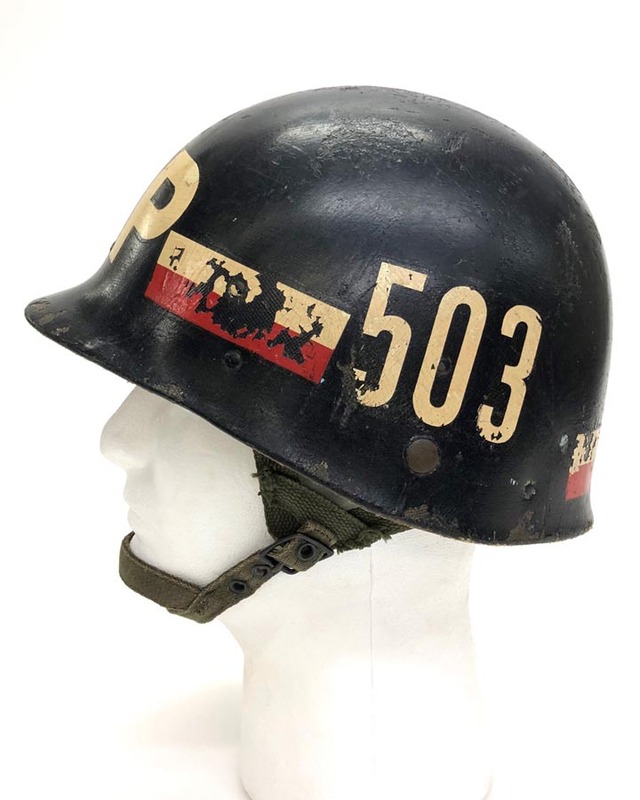 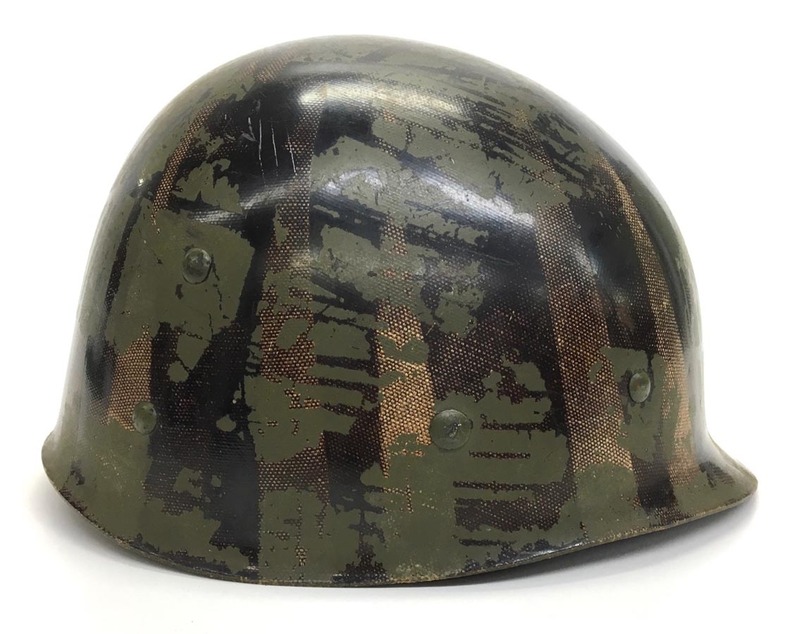 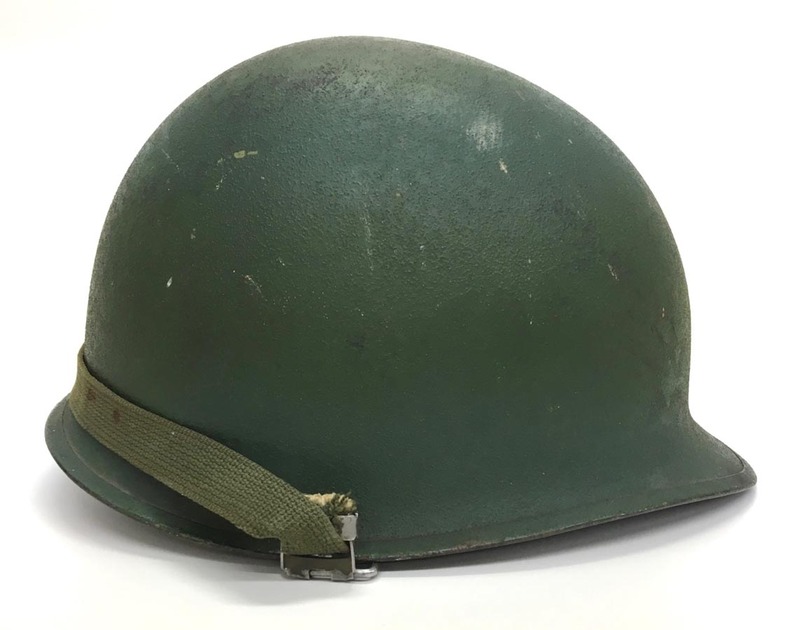 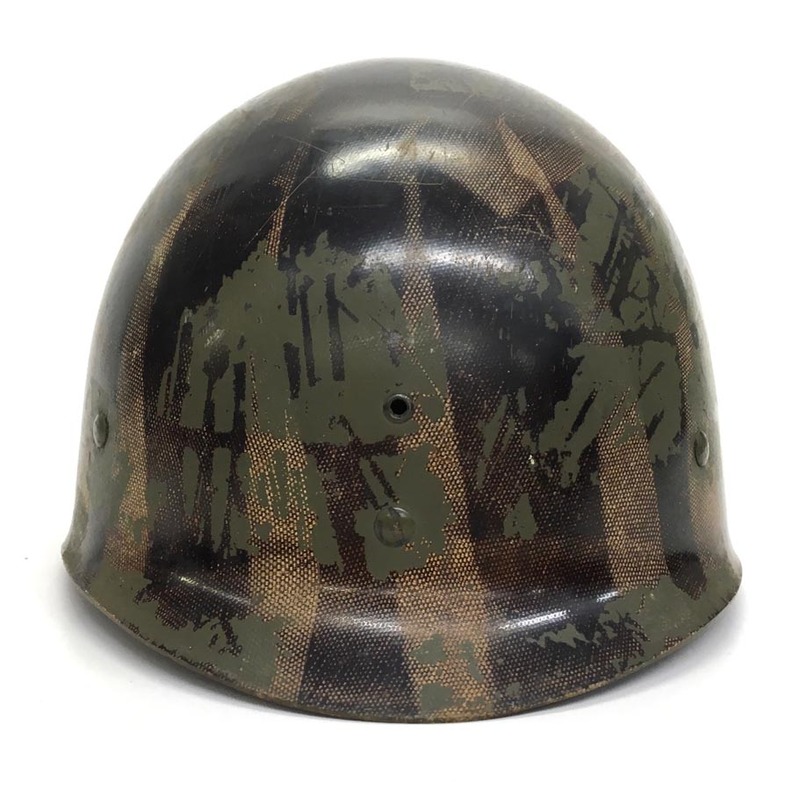 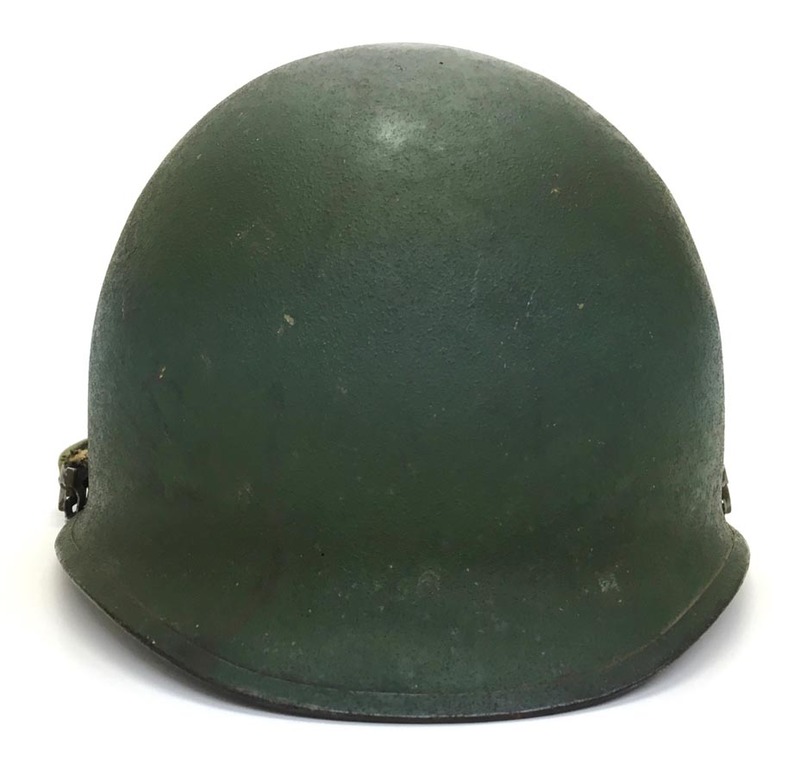 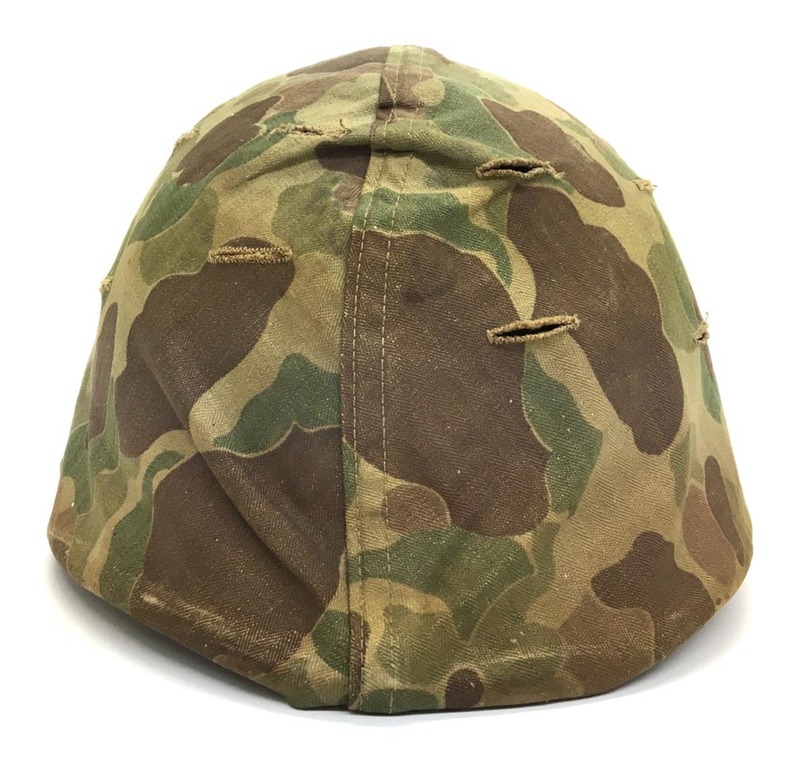 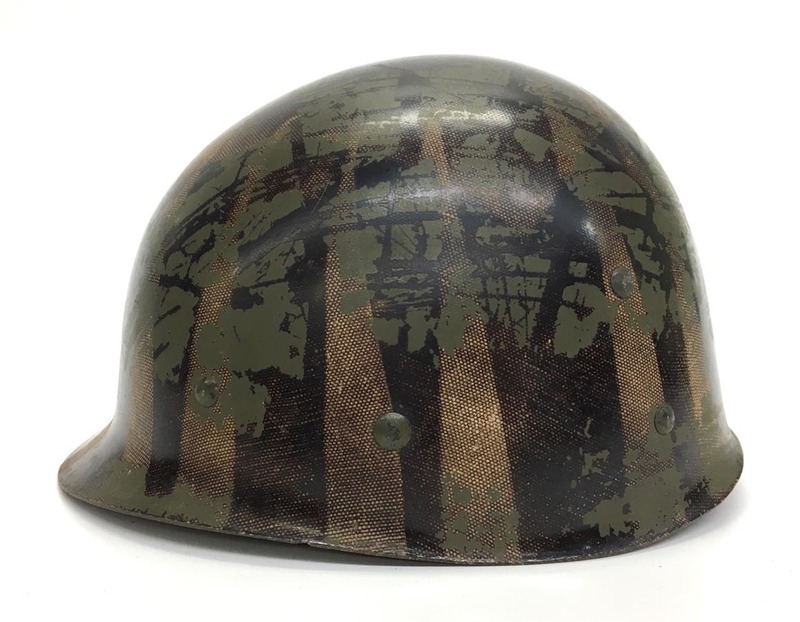 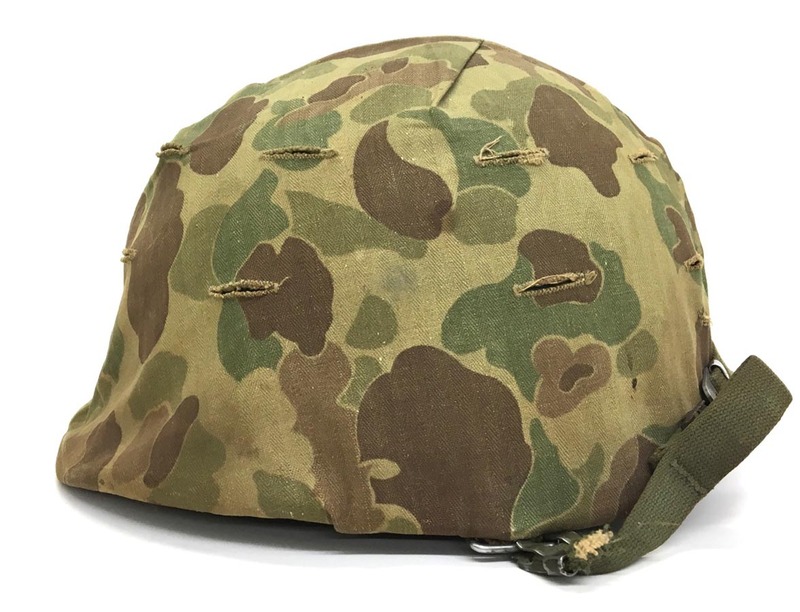 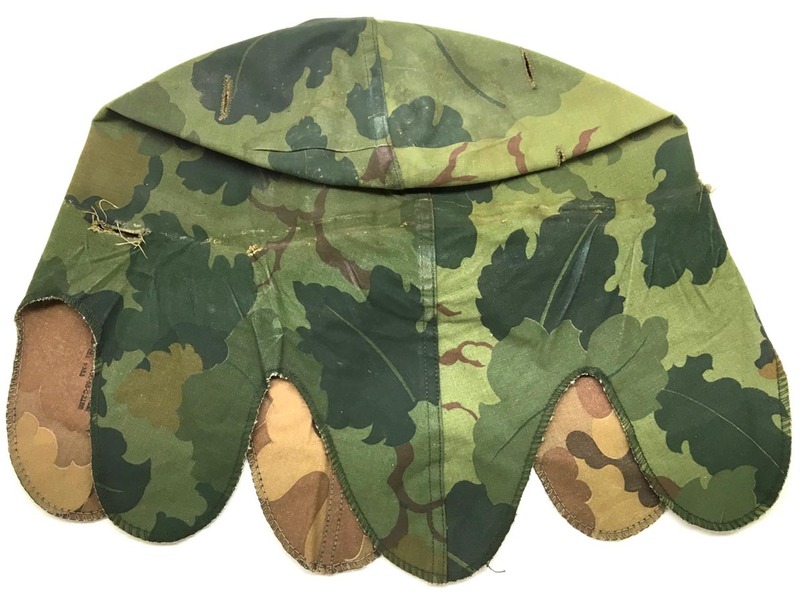 PHYSICAL DESCRIPTION: This Korean Era Marine M1 Helmet with Camo Cover is in nice condition showing some average wear and age. 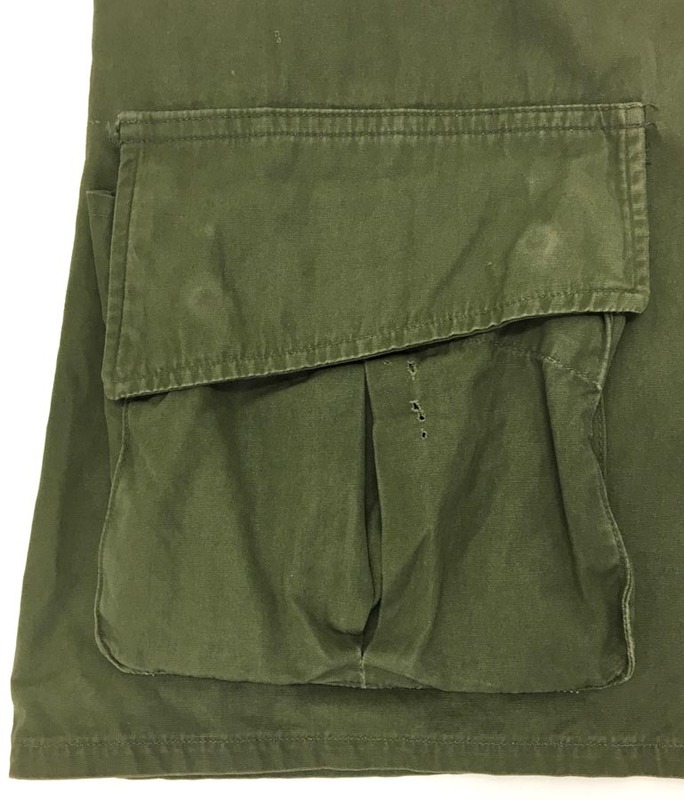 Cover is nice showing some light soiling with no holes or damage. 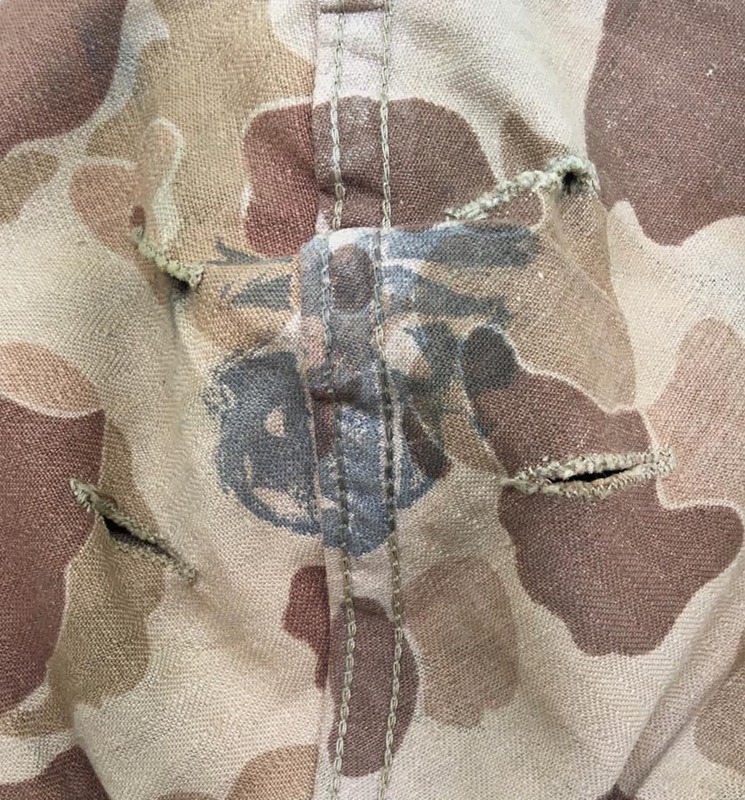 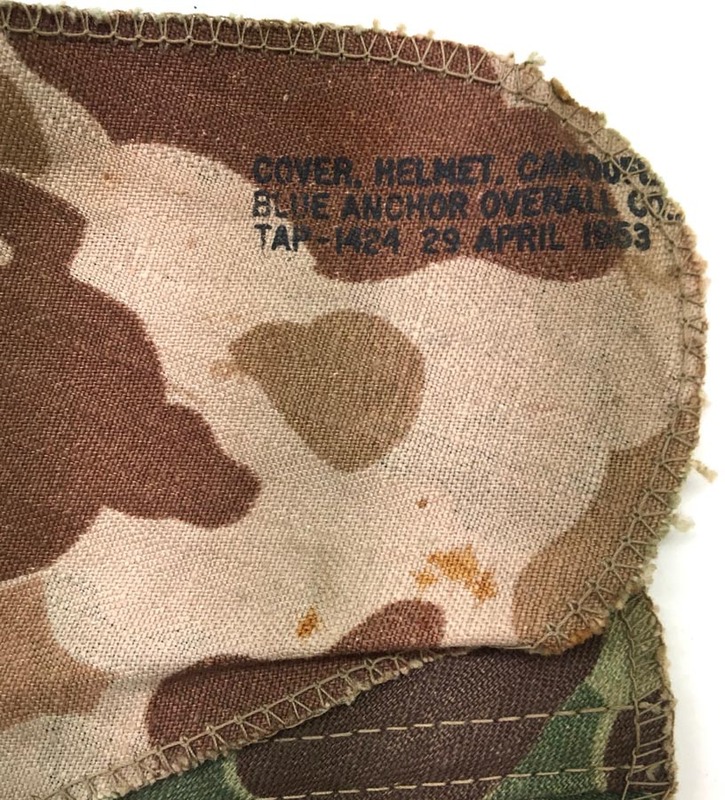 Veteran placed the cover on his helmet with the EG&A on the backside instead of in the front. 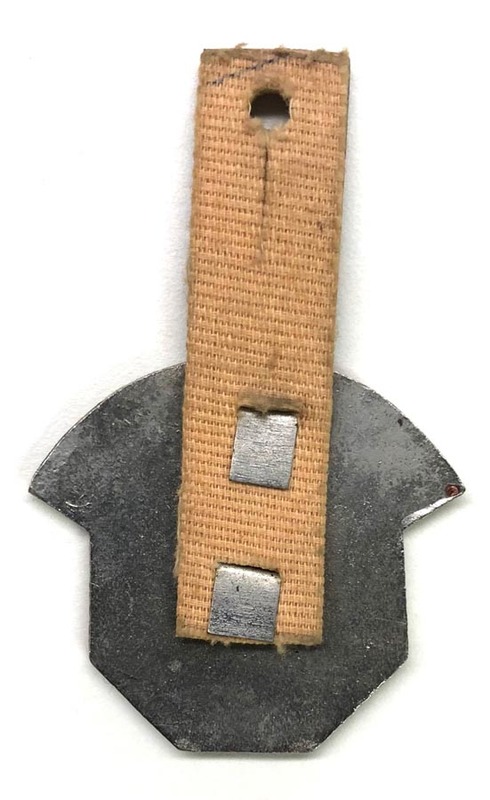 I tried to reverse it but the slits for the chinstrap won't line up properly. 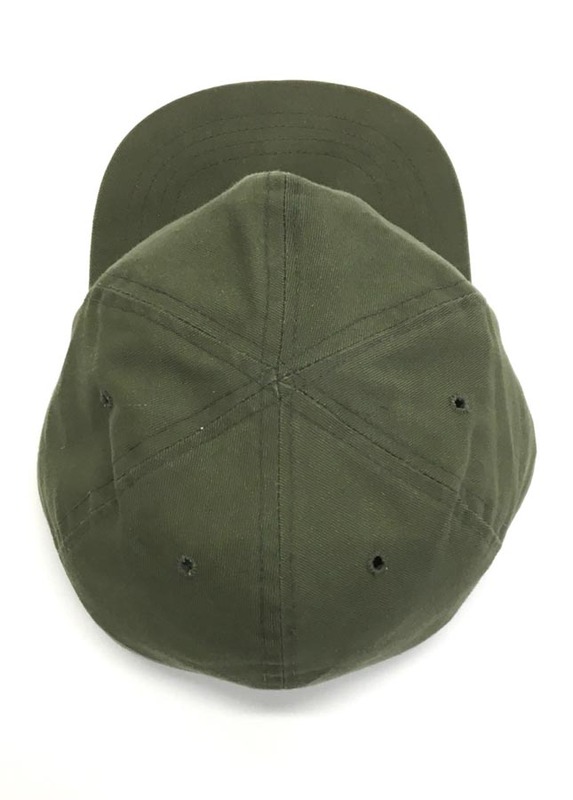 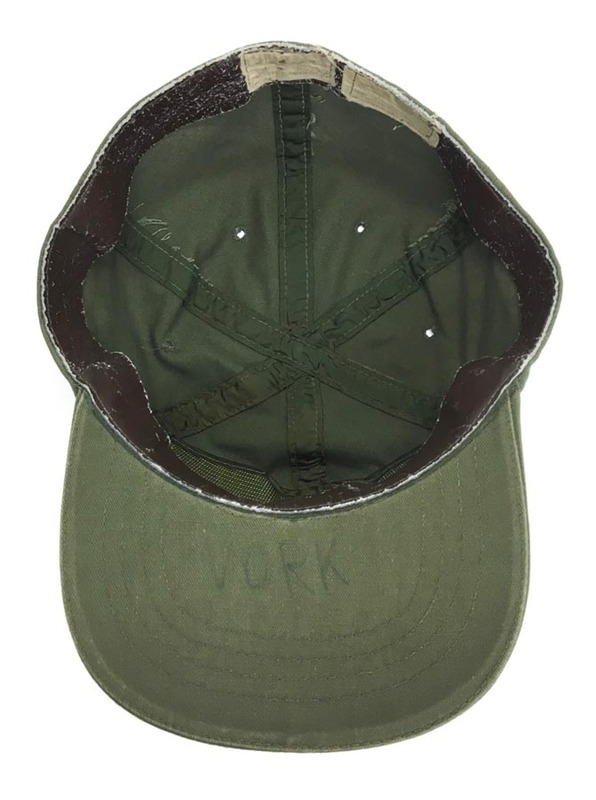 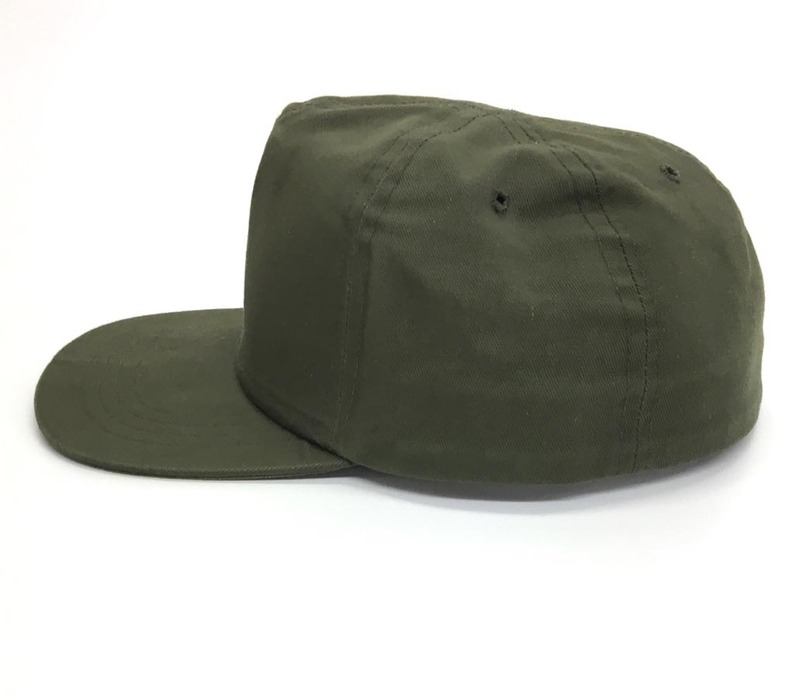 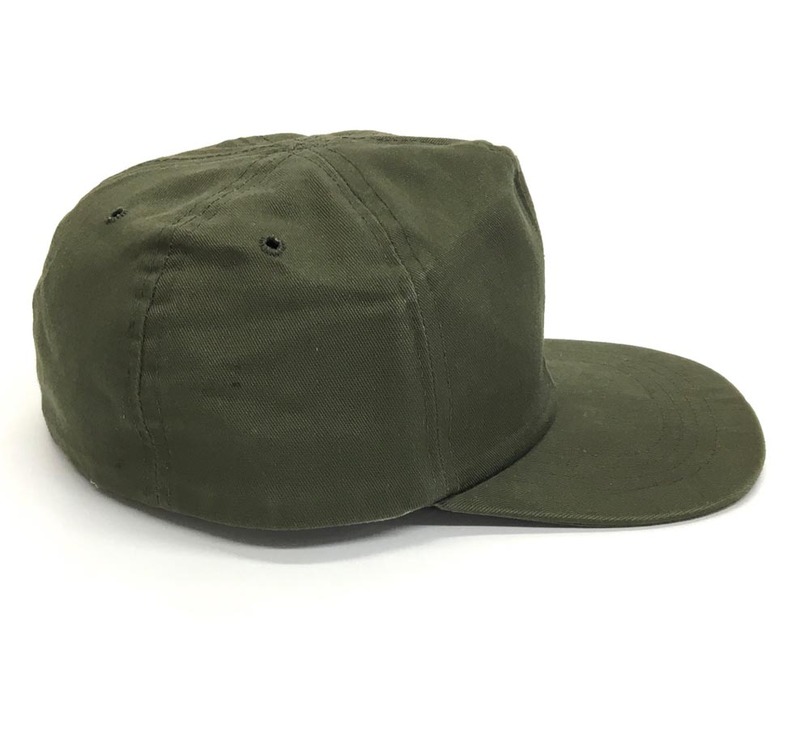 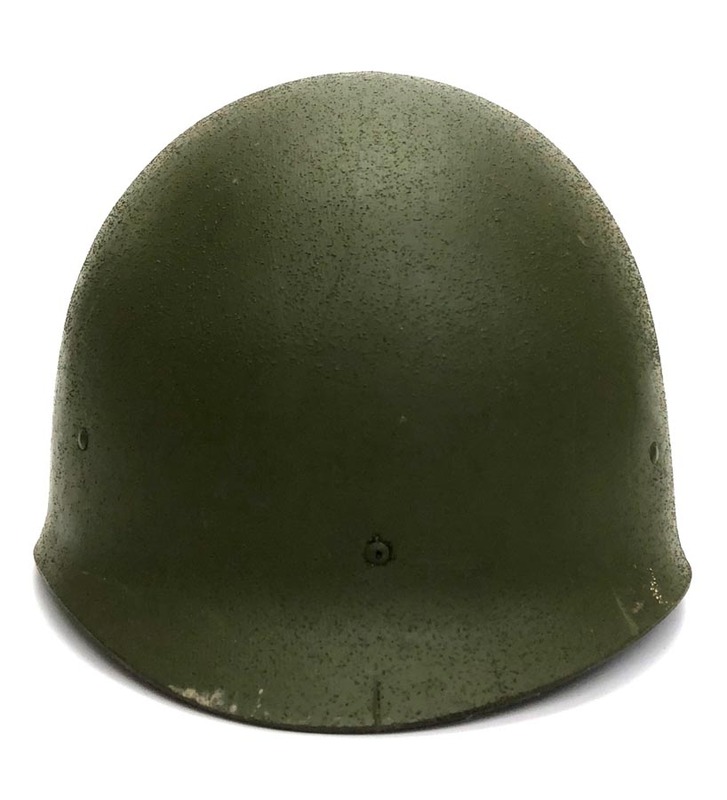 Helmet shell is a dark forest green and interior of shell is more olive drab in color. 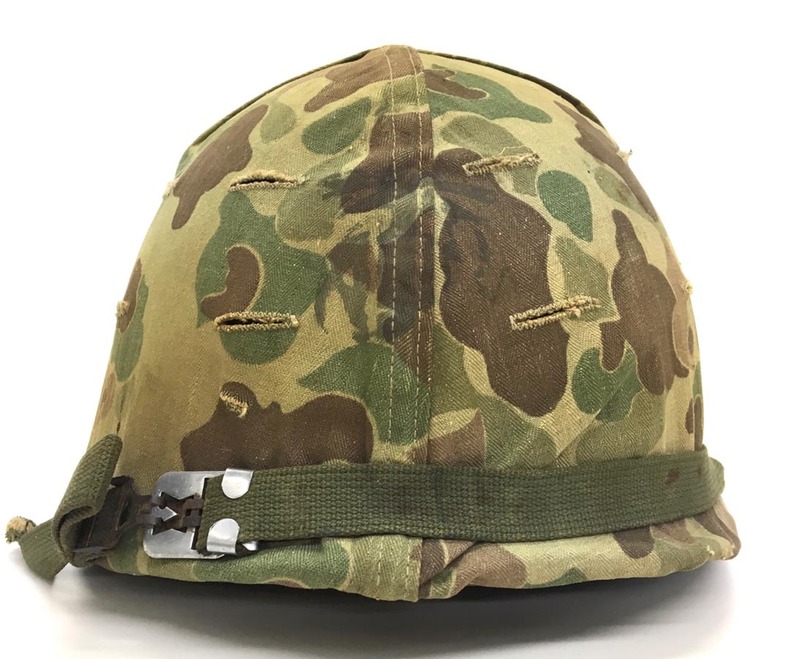 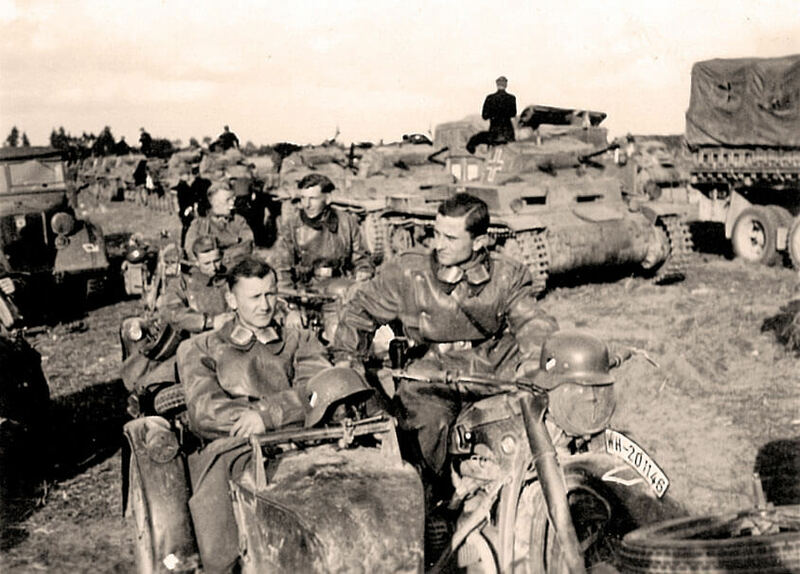 Helmet chinstraps are present and function great. 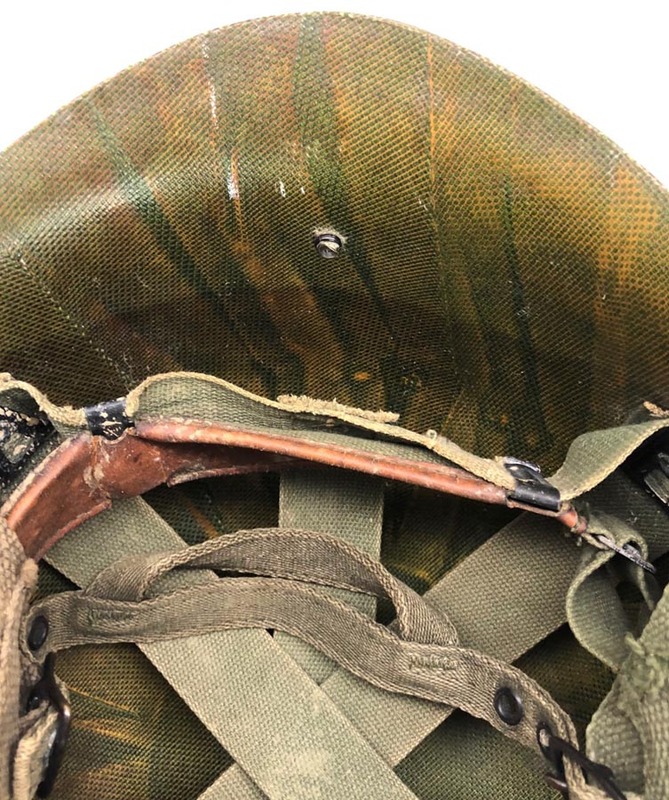 This is a rear seam helmet and is stamped WA57 to inside front. 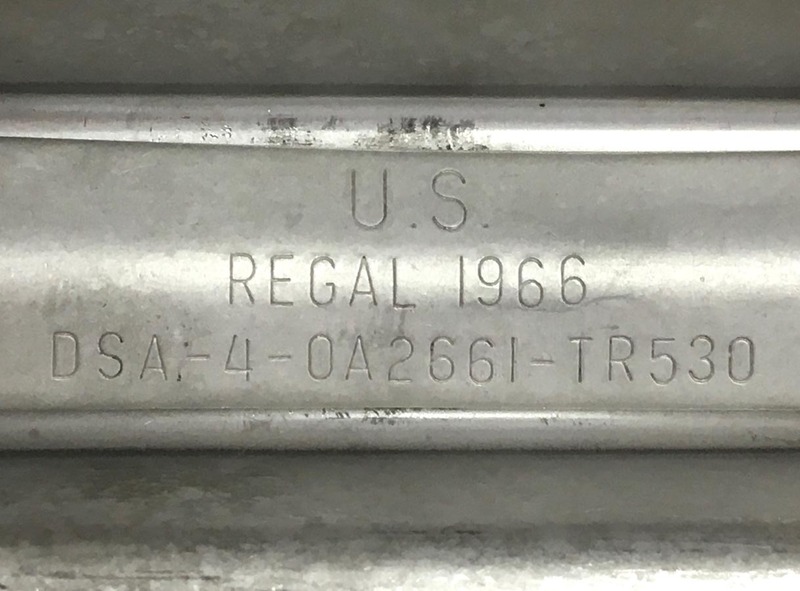 There may be other letters or numbers but the stamping is very light and hard to make out. 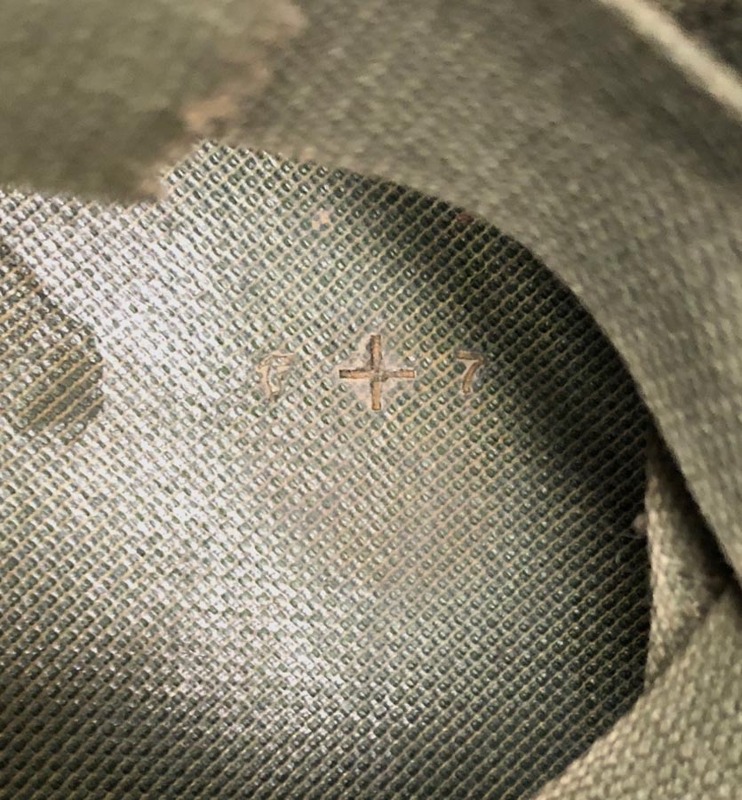 WW2 MSA liner is solid with no cracks or damage. 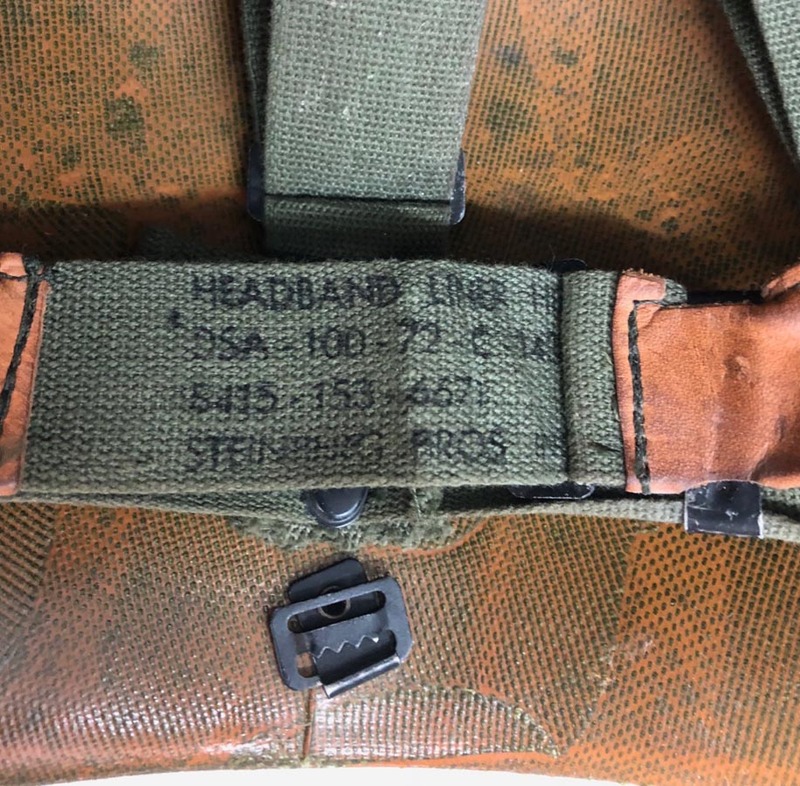 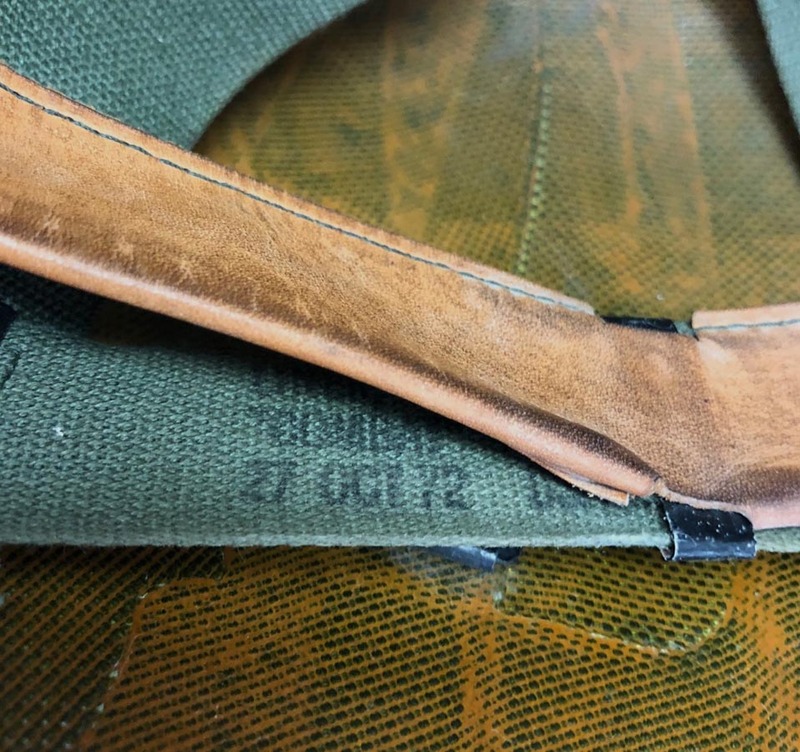 Leather sweatband is dry and shows some damage. 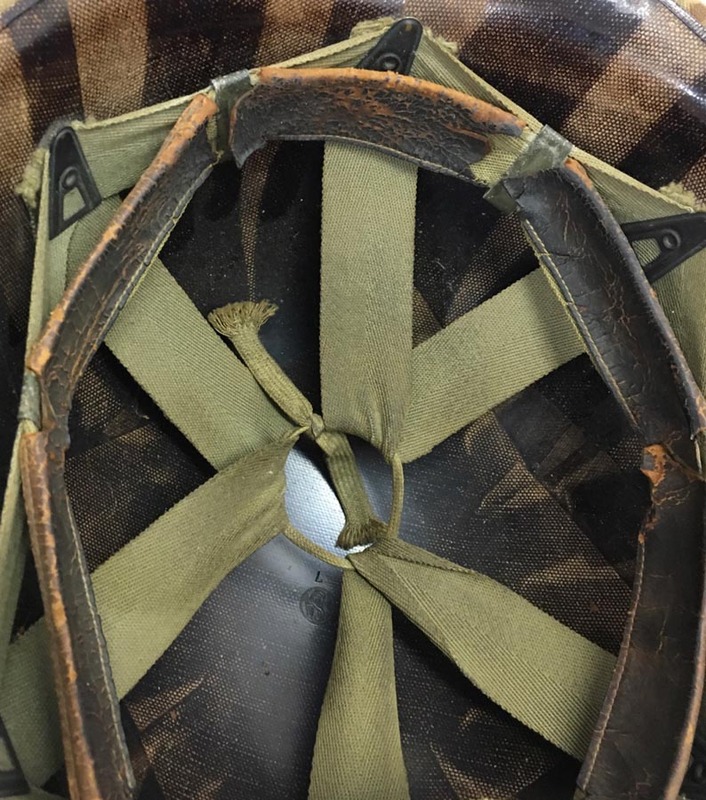 All webbing is intact. 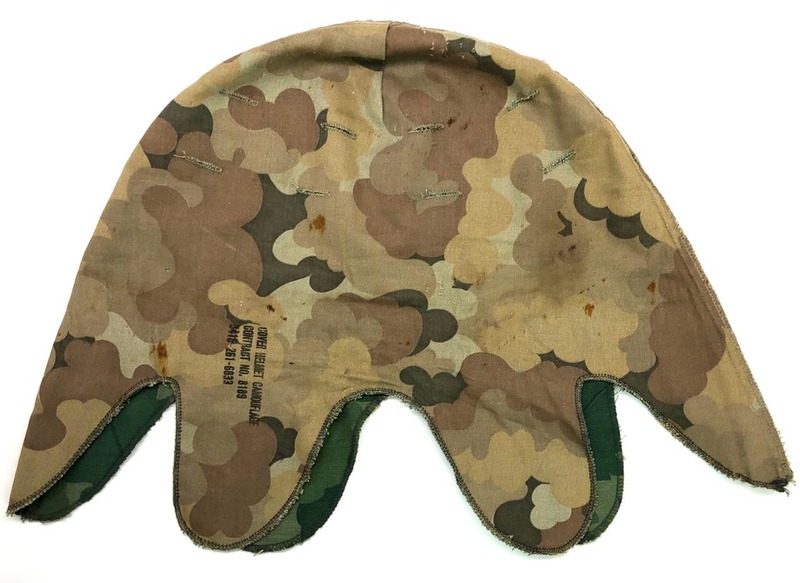 No leather chinstrap to liner. 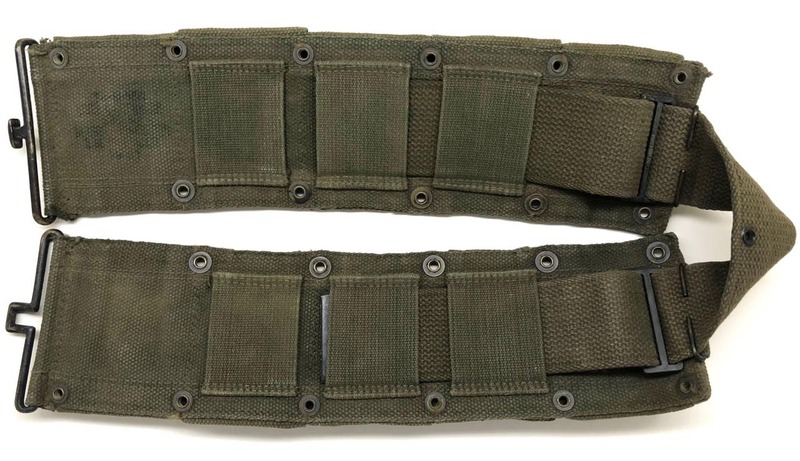 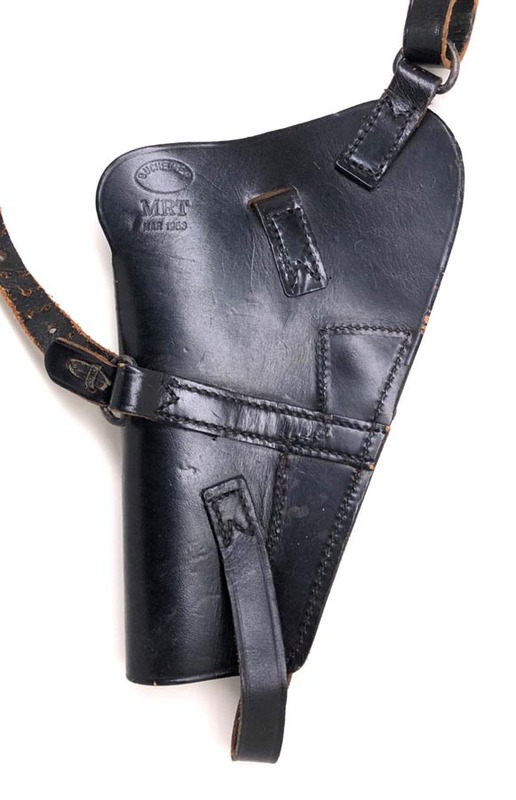 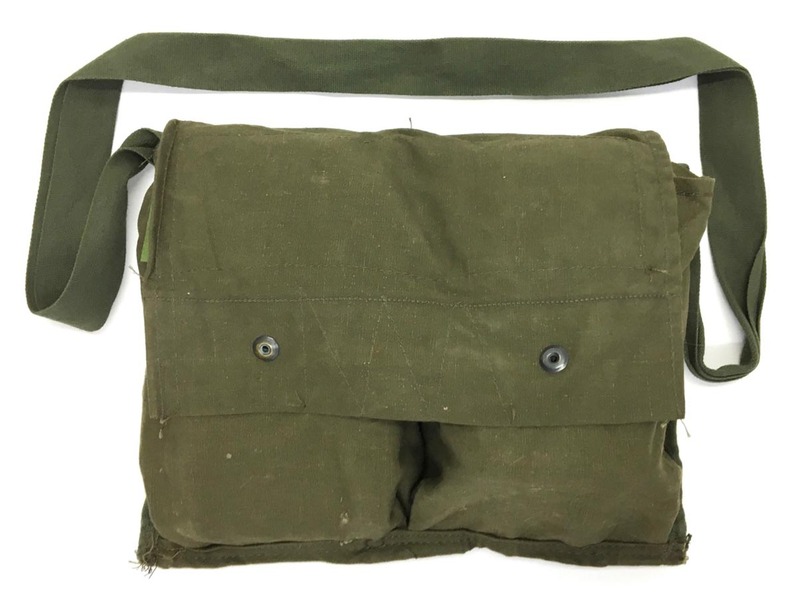 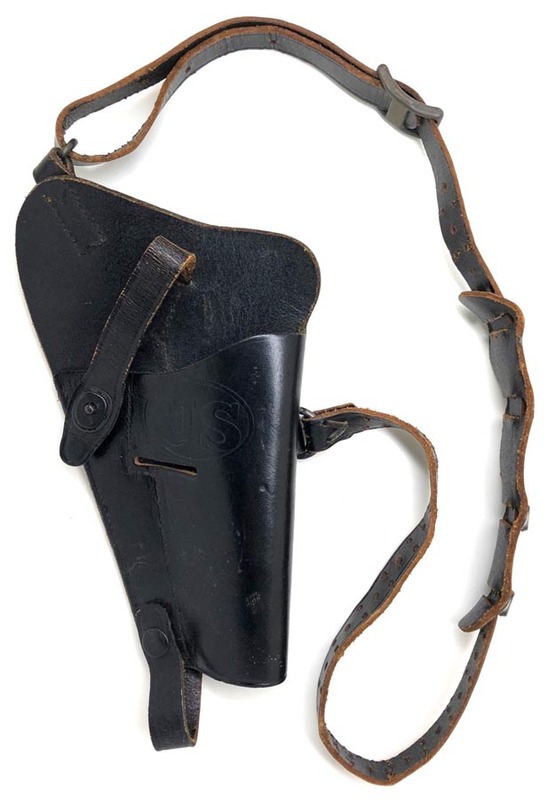 PHYSICAL DESCRIPTION: This US Vietnam Era M7 Colt M1911 Shoulder Holster is in nice condition showing some use. 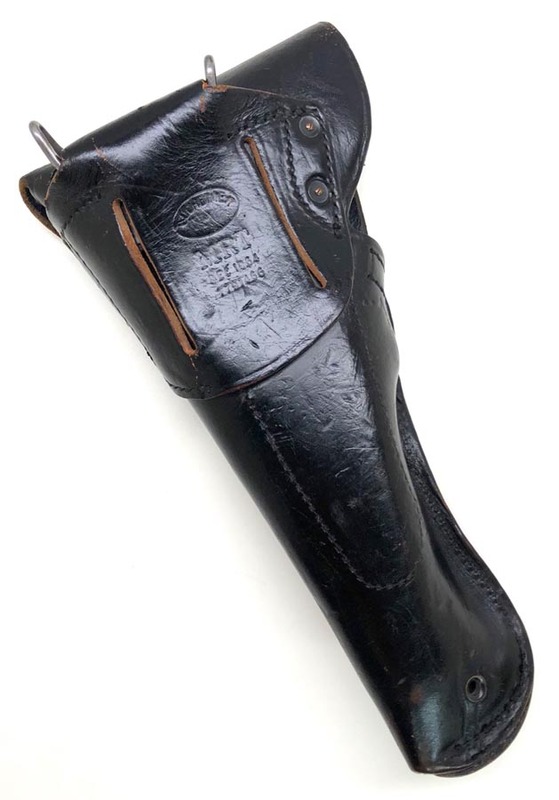 all leather is supple with no rot. 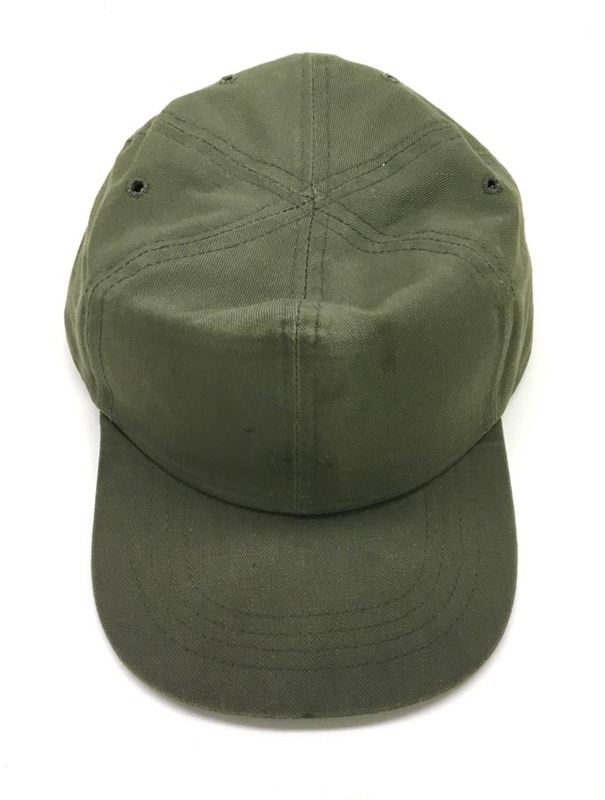 All snaps function great. 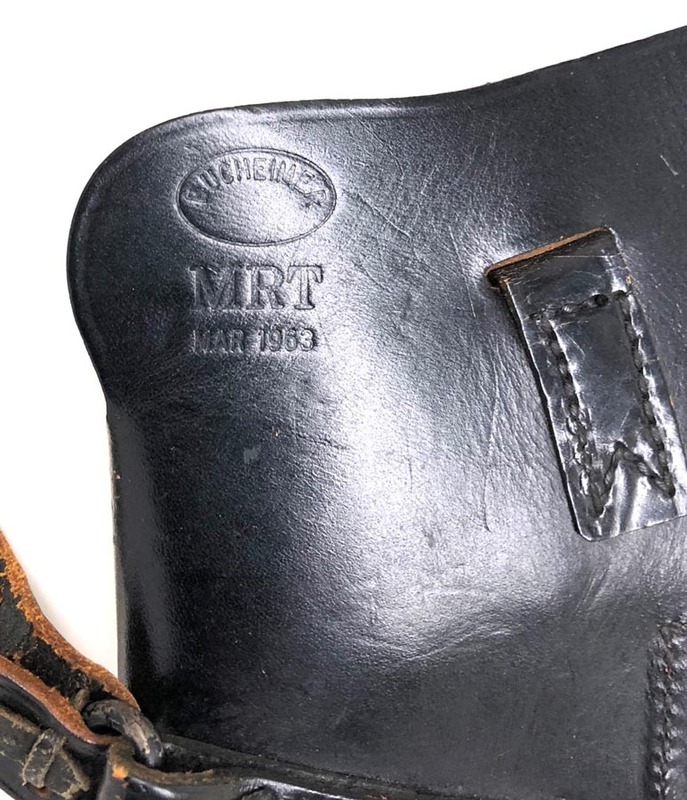 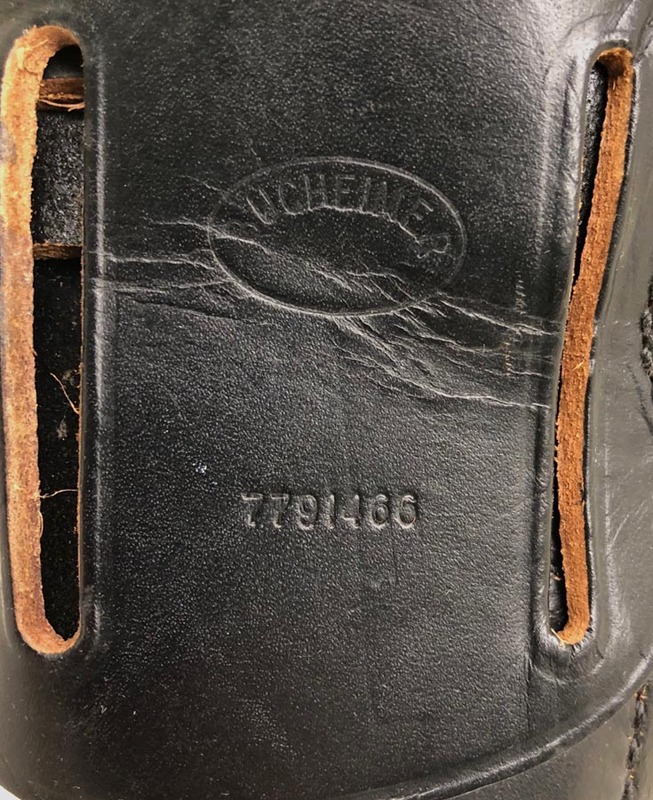 Holster is Bucheimer MRT Mar 1963 marked to backside. 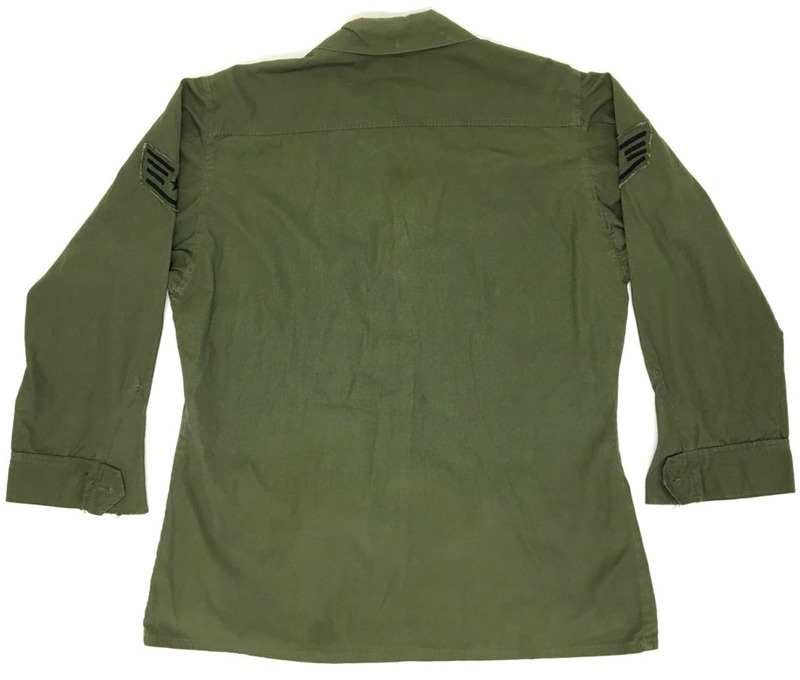 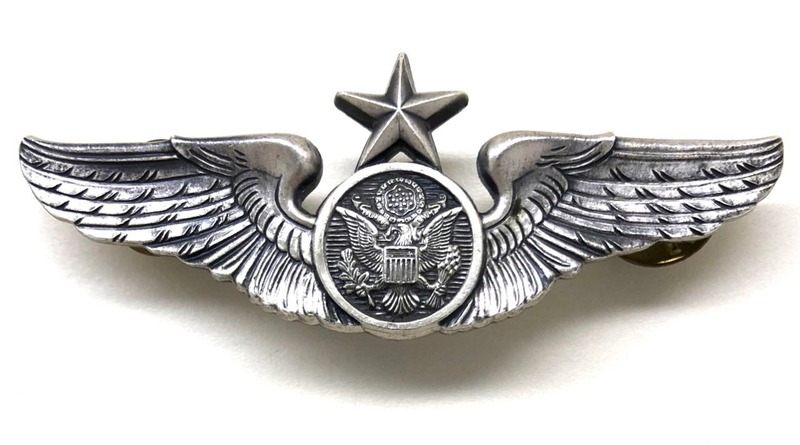 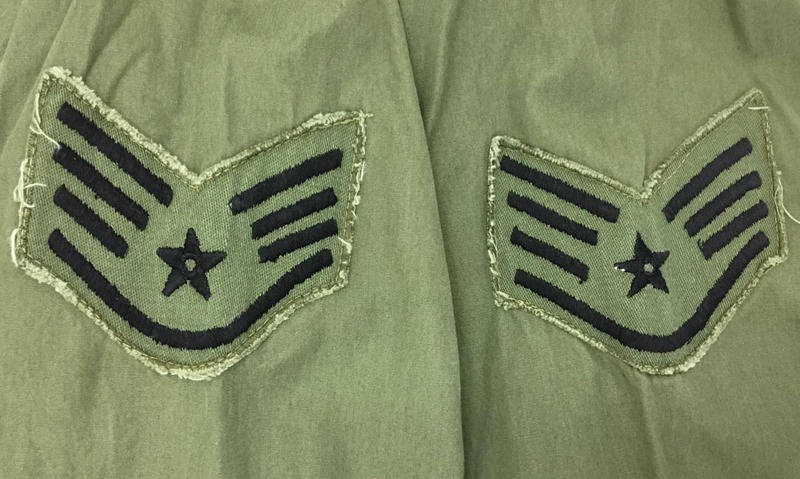 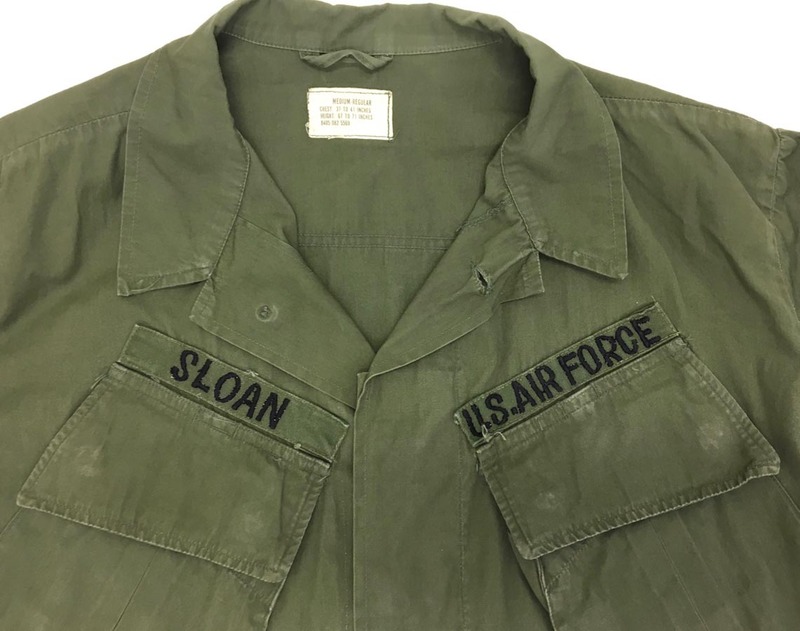 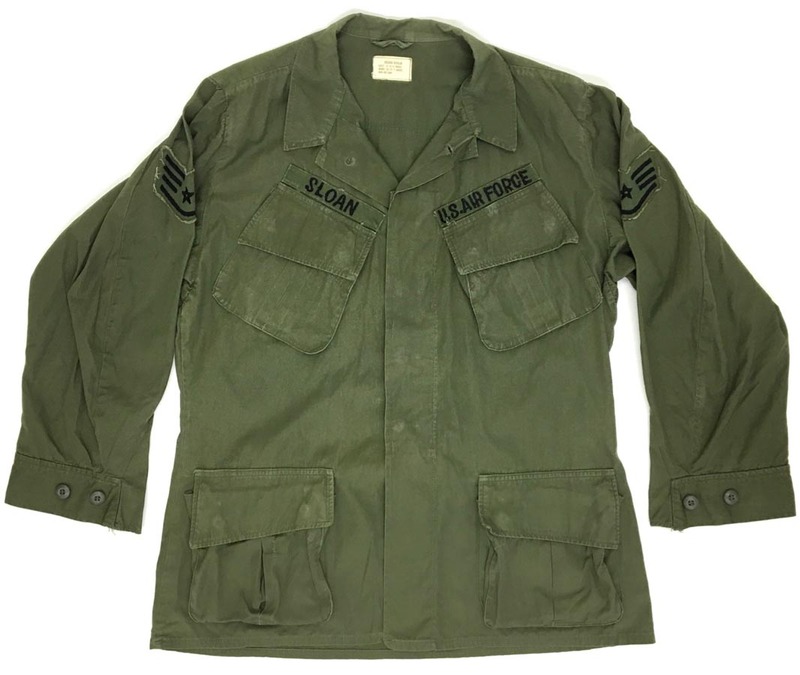 PHYSICAL DESCRIPTION: This USAF Sterling Master Aircrew Wings are in real nice condition. 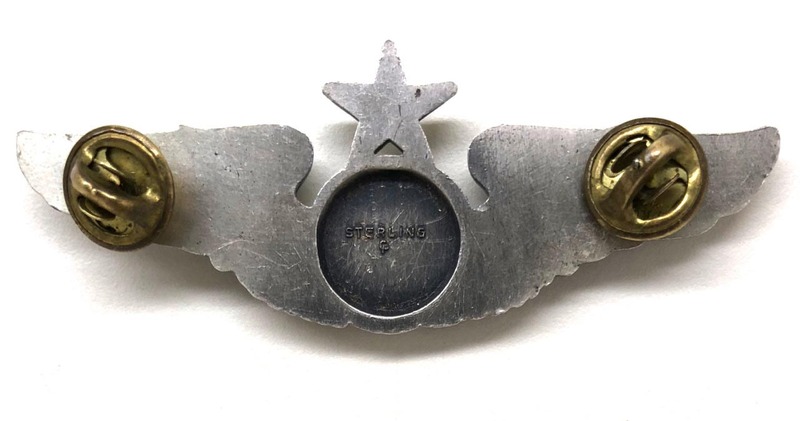 Wings are Sterling GP marked to reverse. 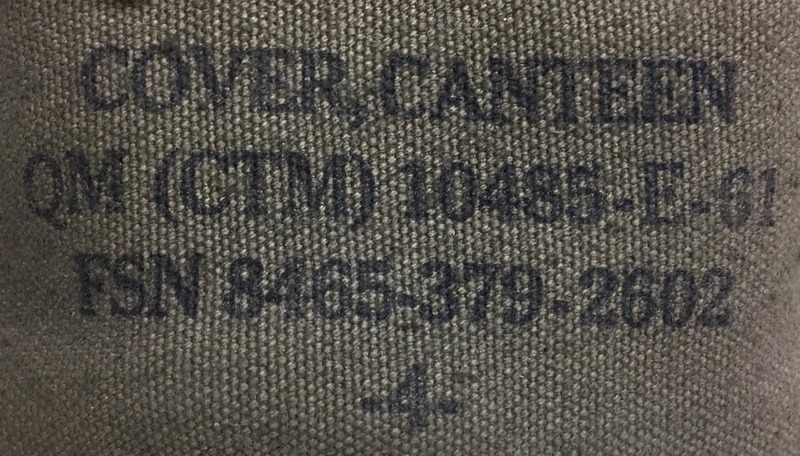 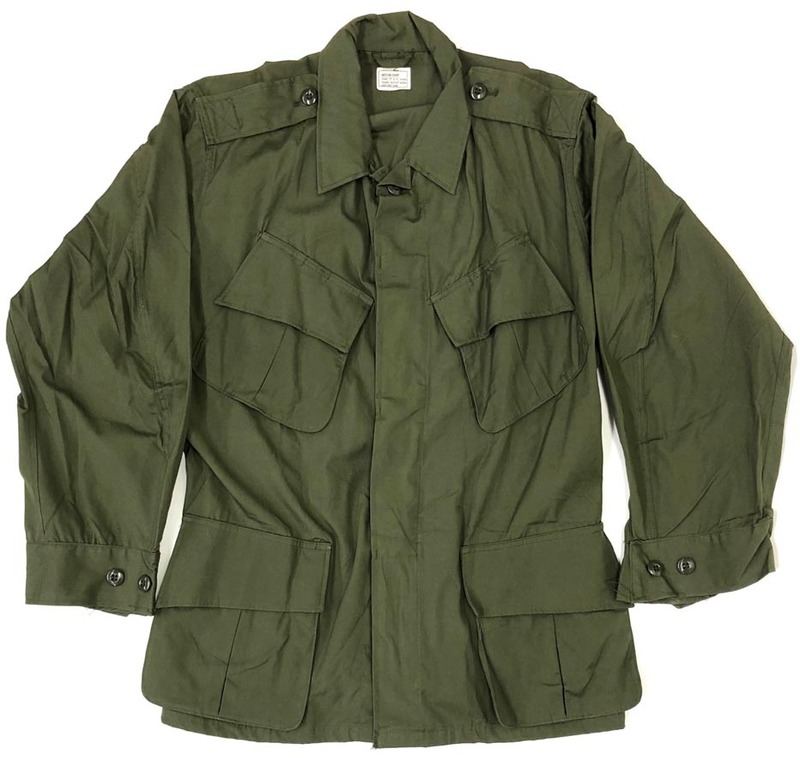 GP represents the "General Products" company. 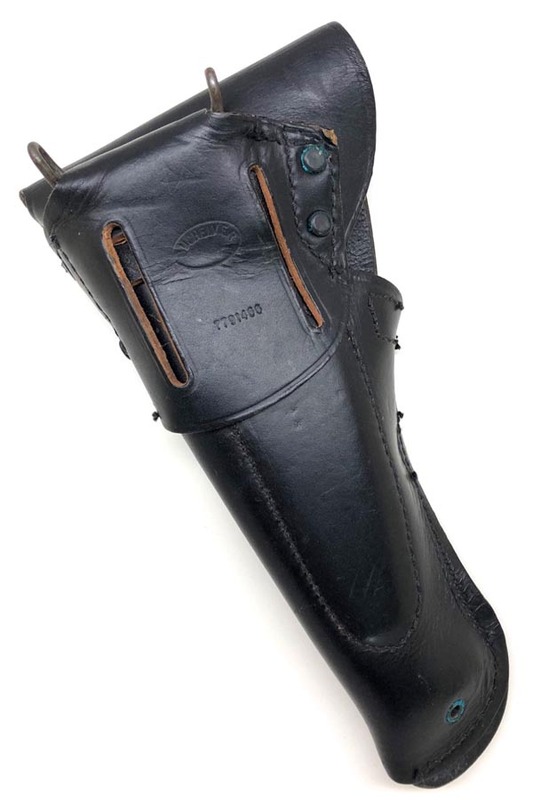 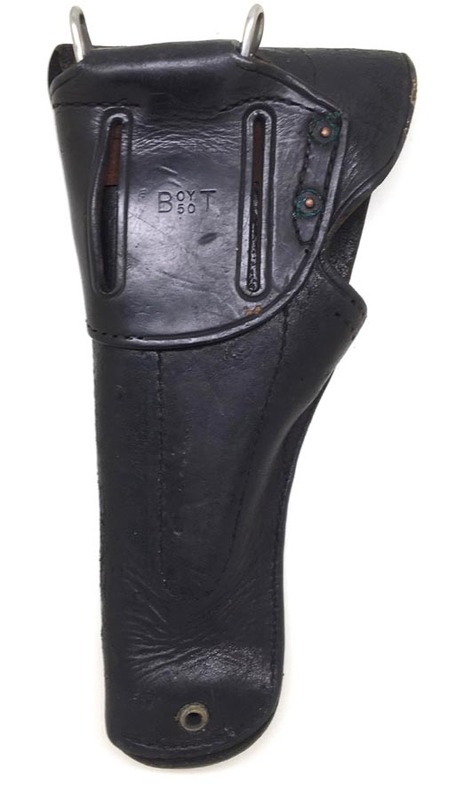 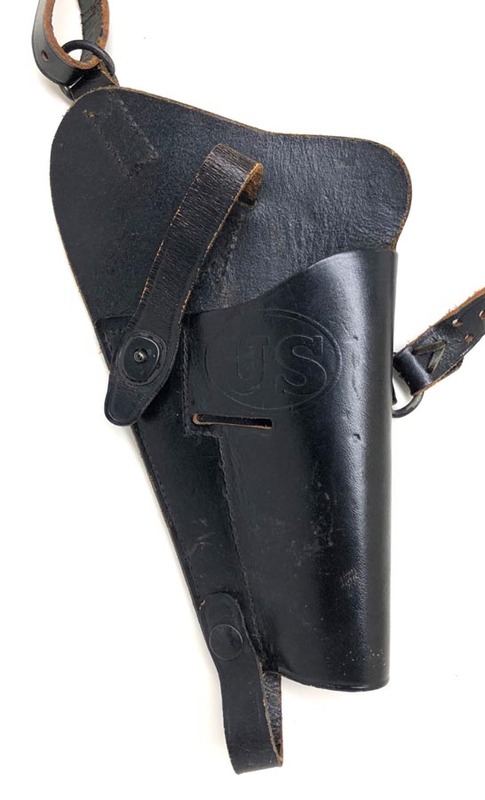 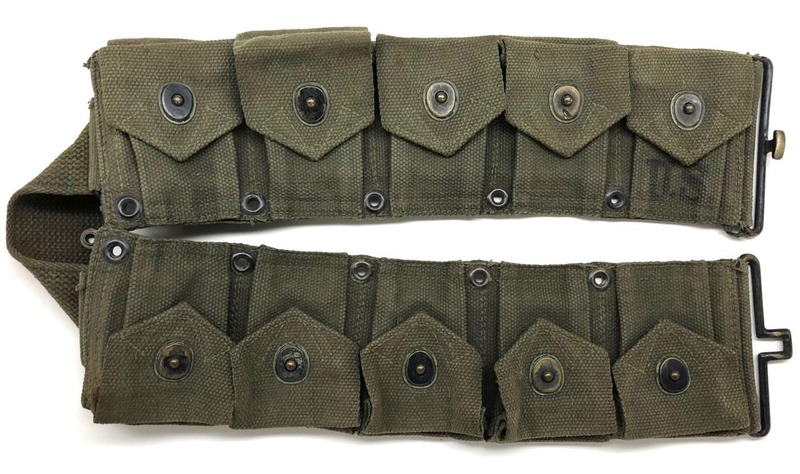 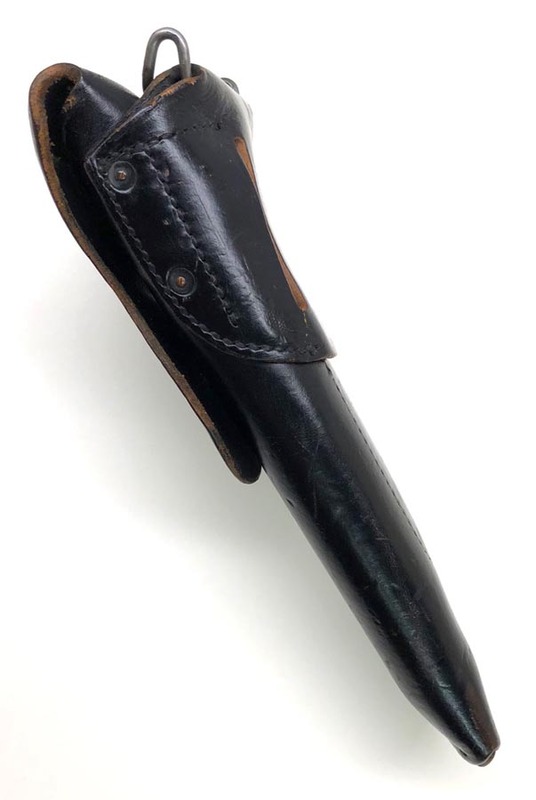 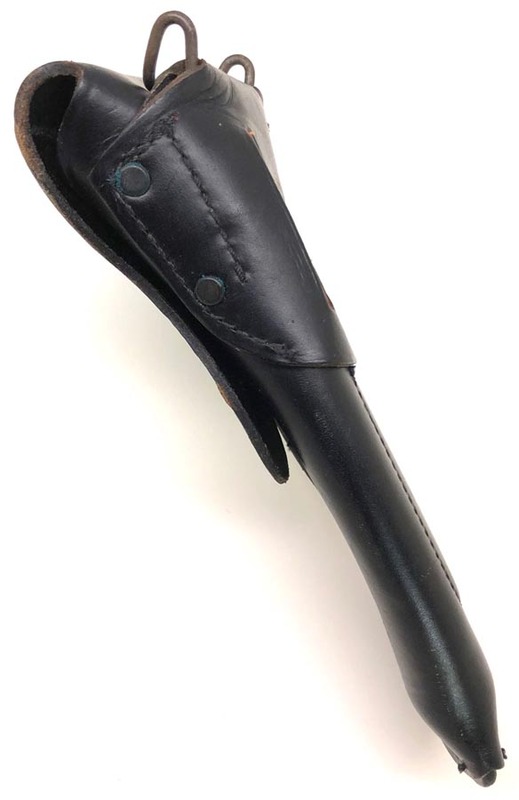 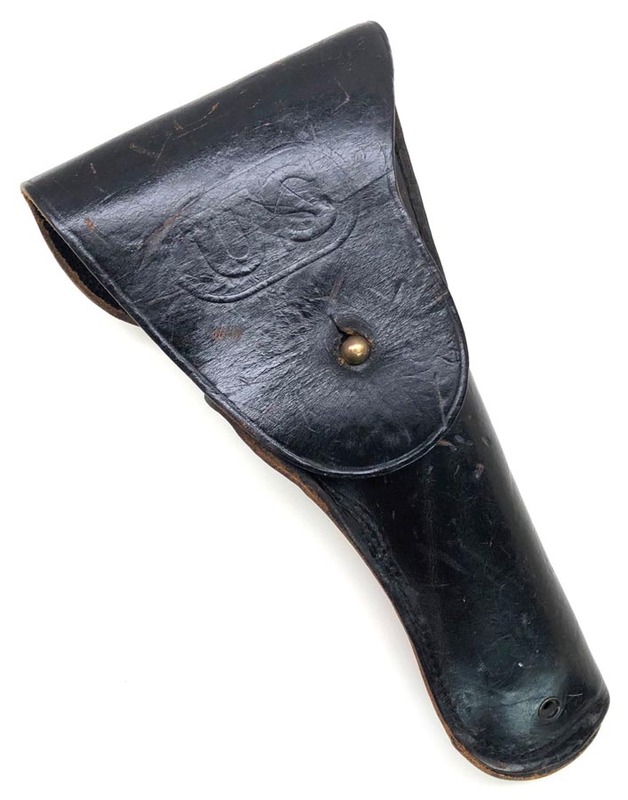 PHYSICAL DESCRIPTION: This US Vietnam Era Colt 1911 Bucheimer holster is in excellent condition. 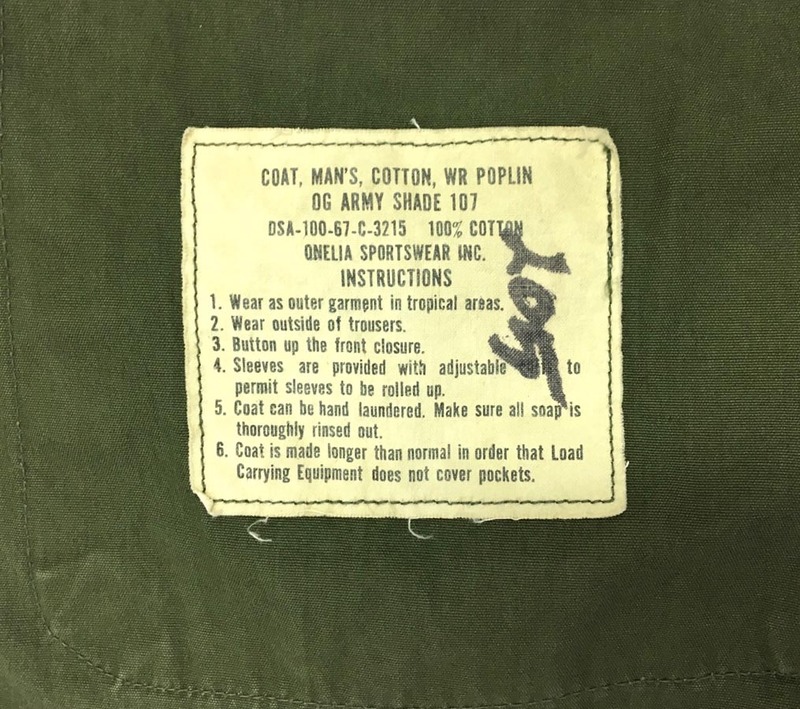 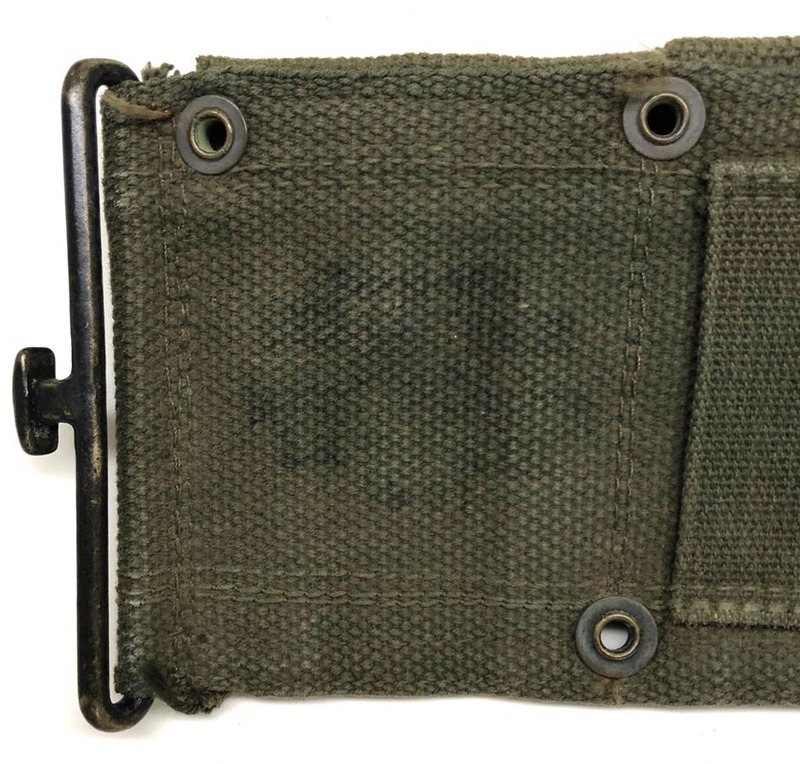 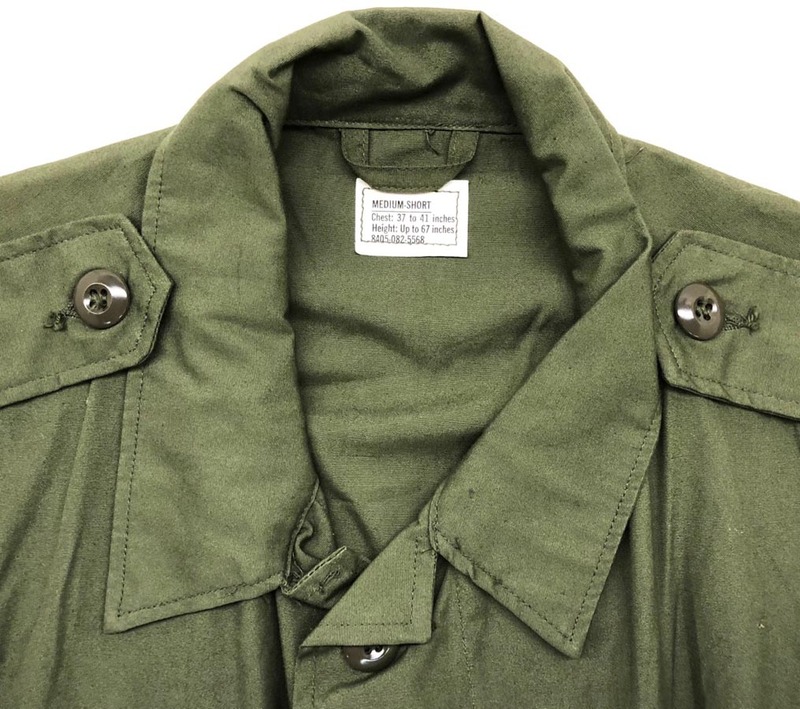 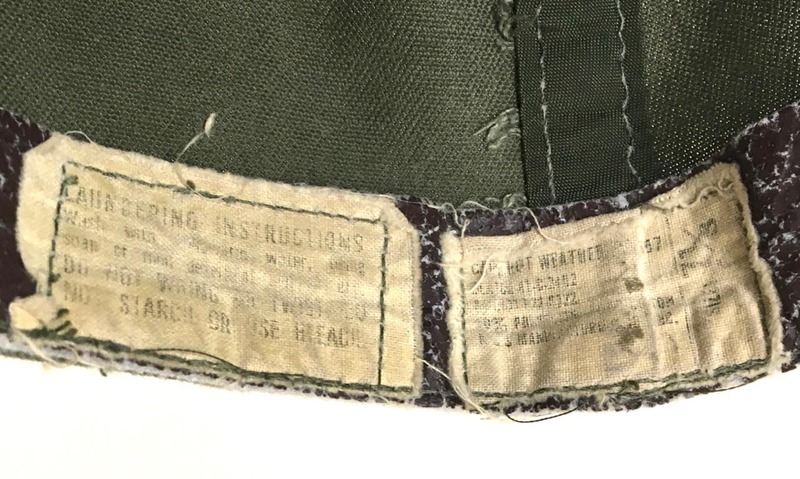 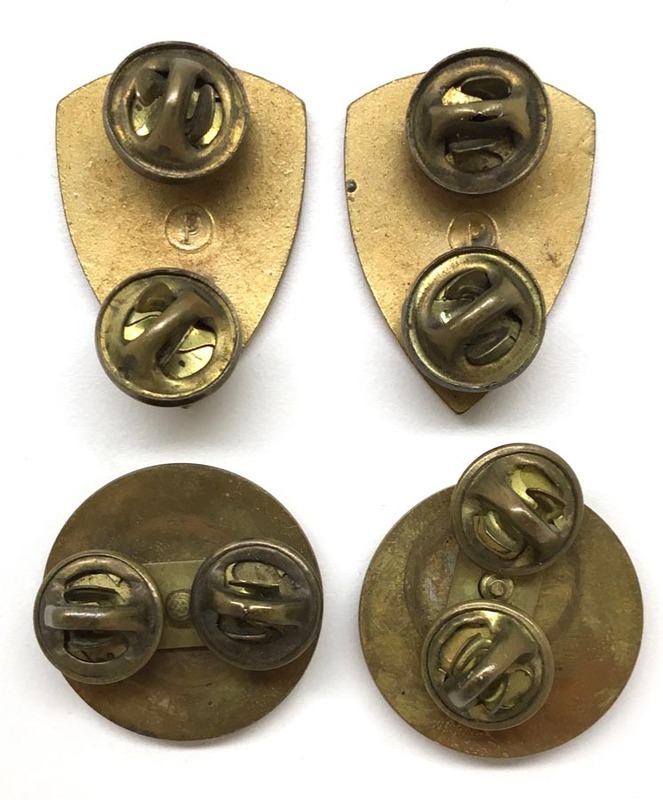 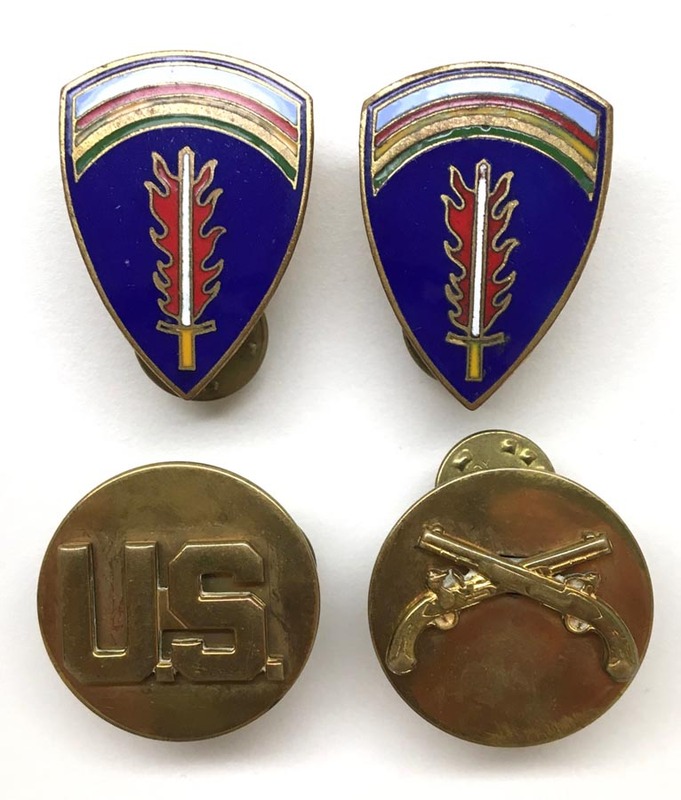 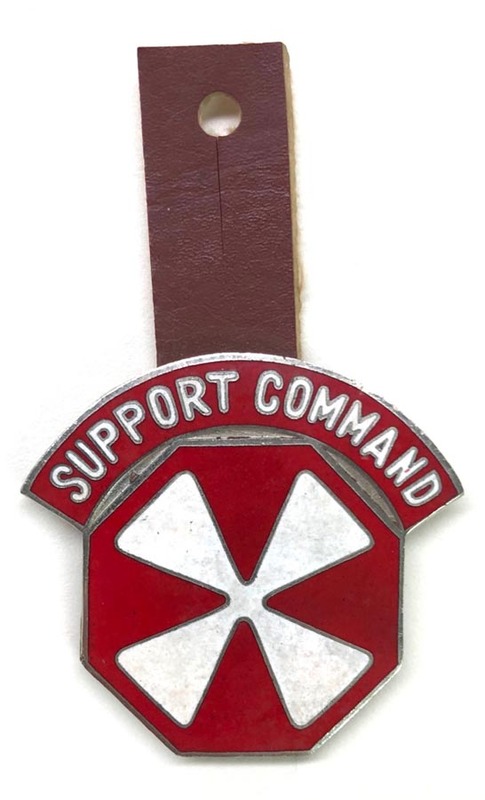 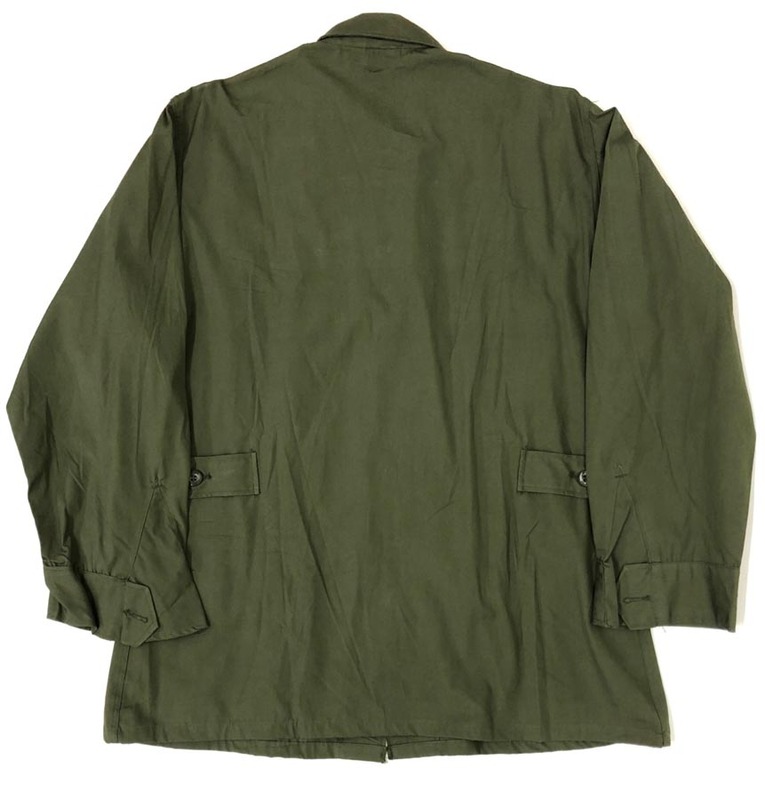 PHYSICAL DESCRIPTION: This US 8th Army Pocket Hanger Patch is in real nice condition. 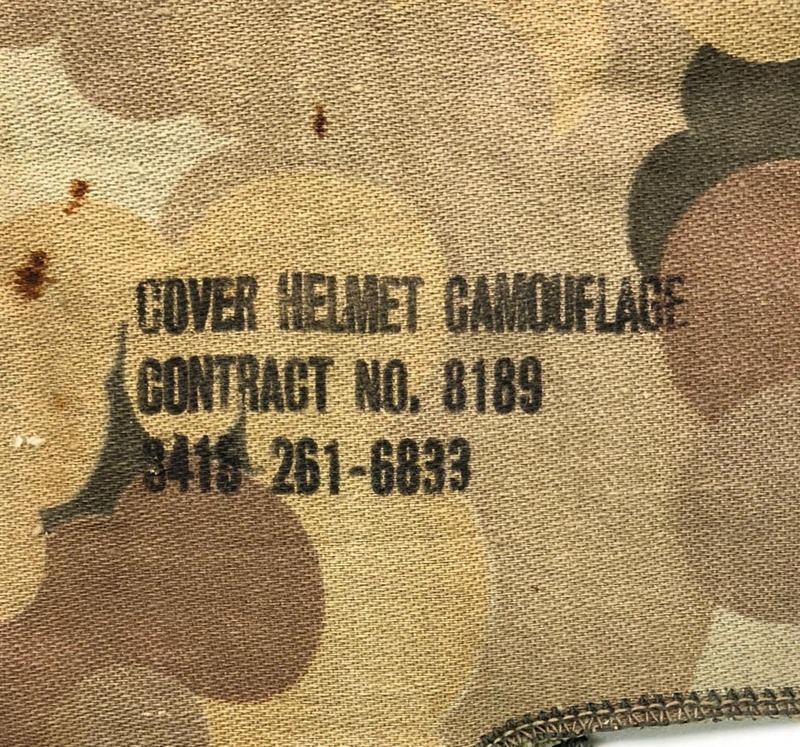 No enamel damage. 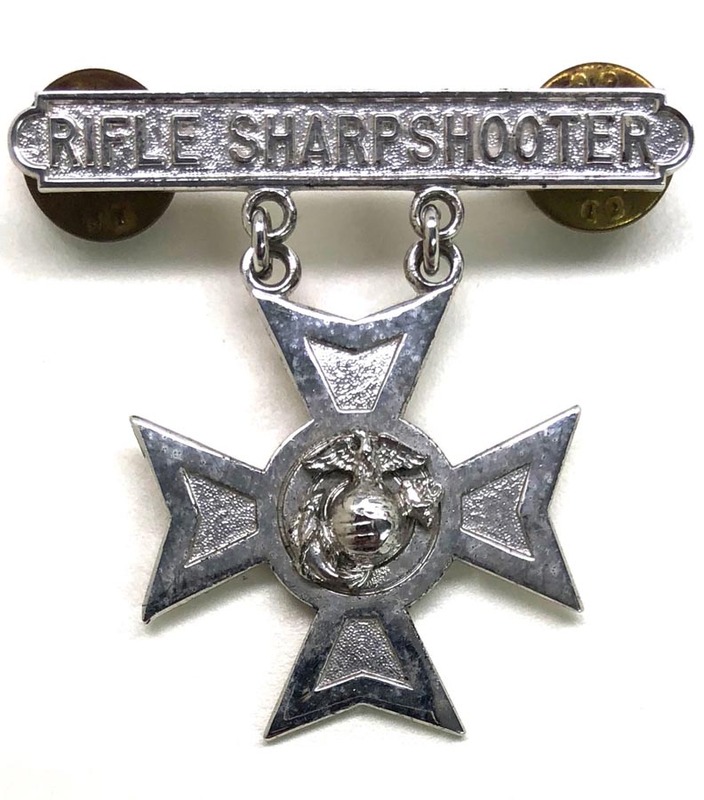 PHYSICAL DESCRIPTION: This US Marine Sterling Rifle Sharpshooter Badge is in nice condition. 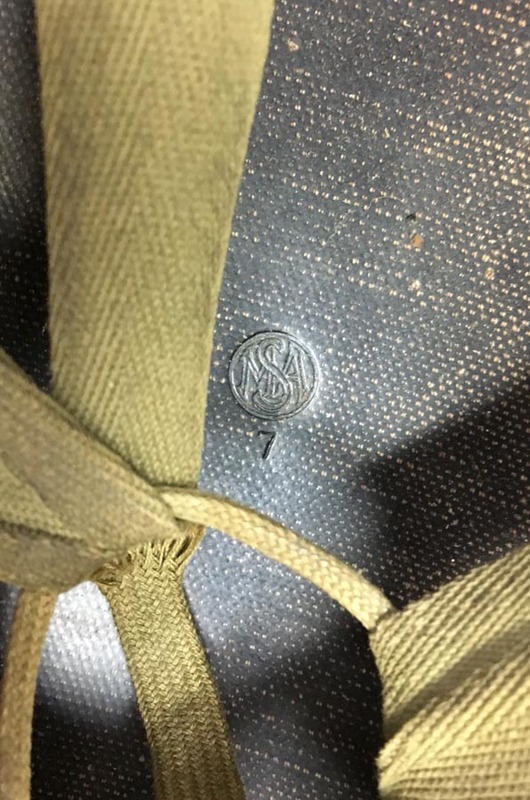 Backside is marked 12C Sterling. 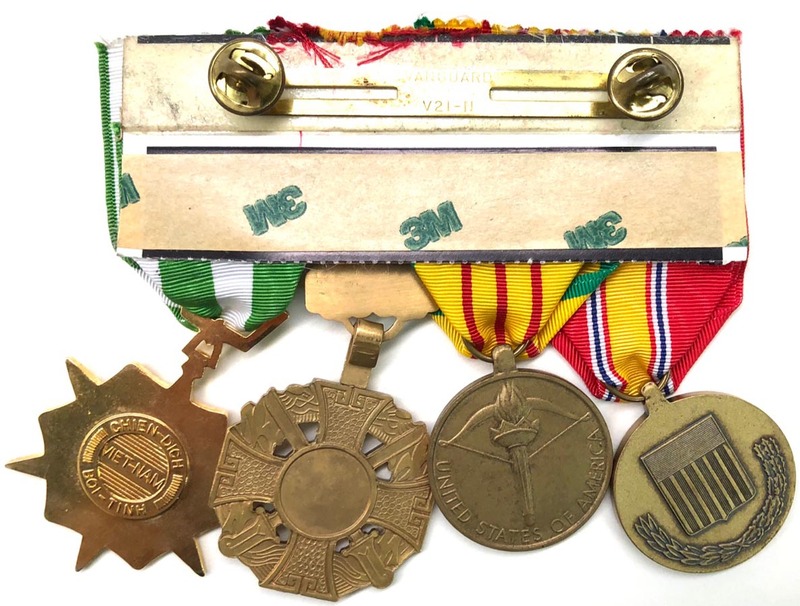 PHYSICAL DESCRIPTION: This US Vietnam Era Medal bar is in real nice condition. 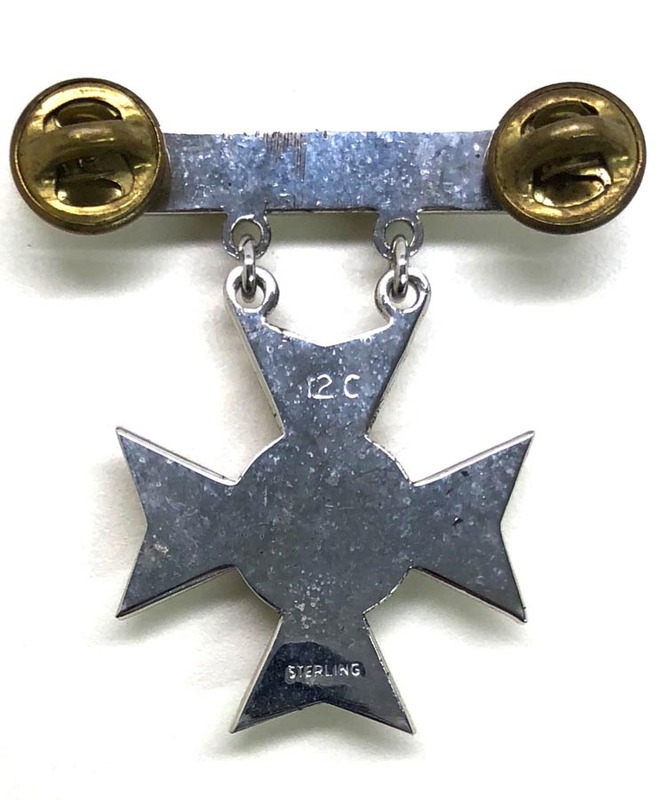 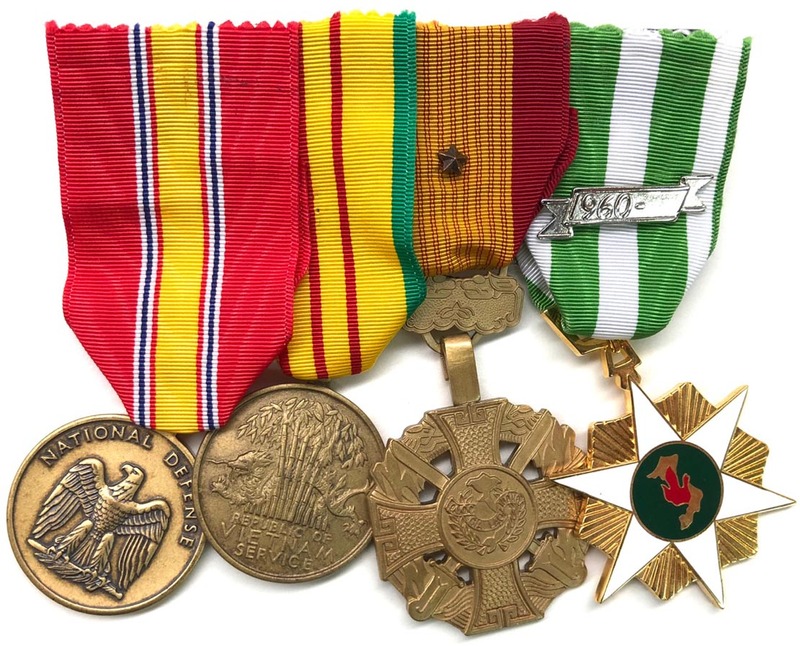 medal bar consists of the National Defense Medal, Republic of Vietnam Service Medal, South Vietnam Gallantry Cross and the Republic of Vietnam Campaign Medal. 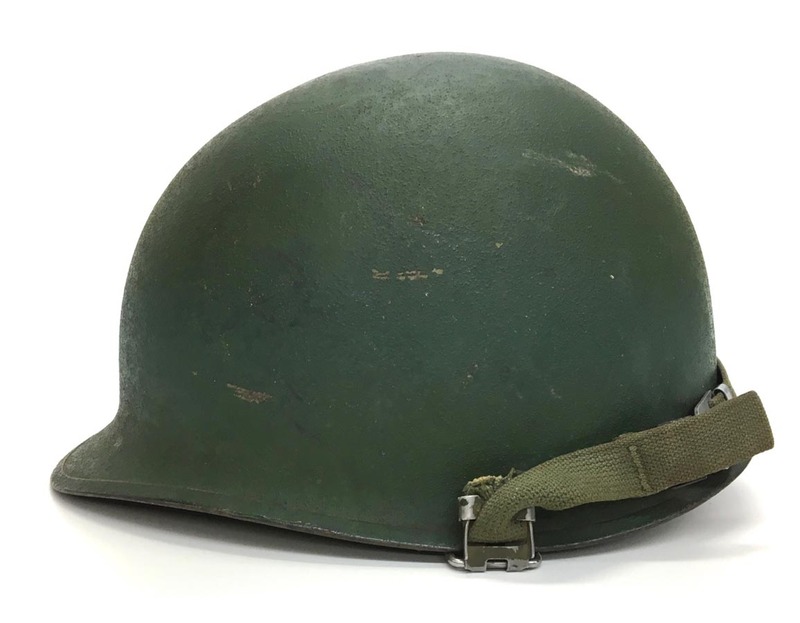 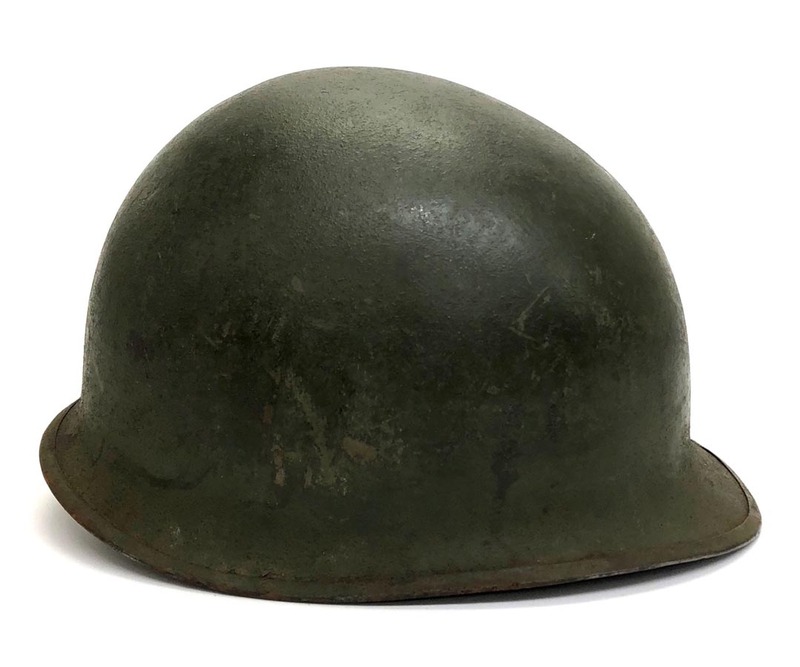 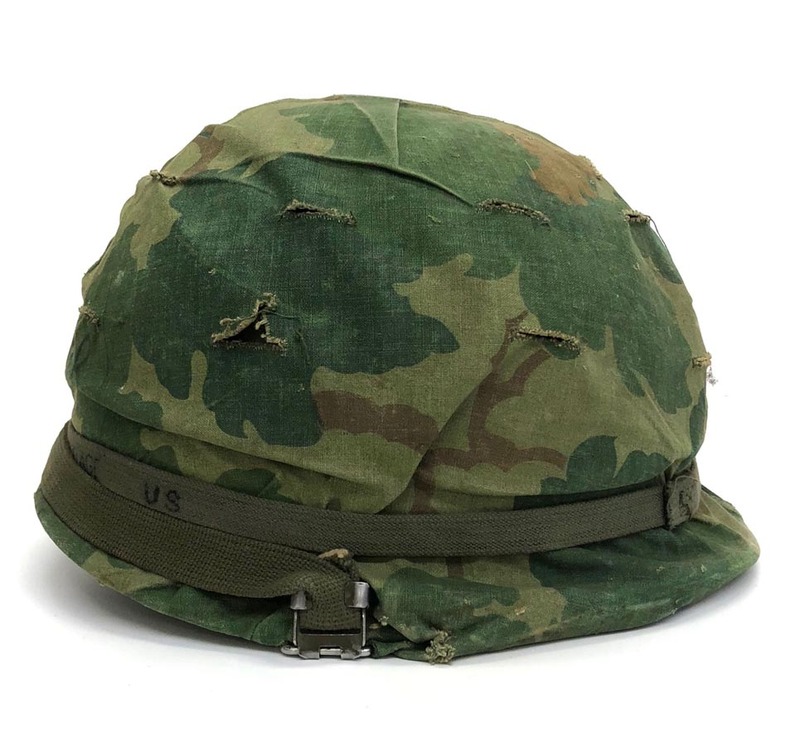 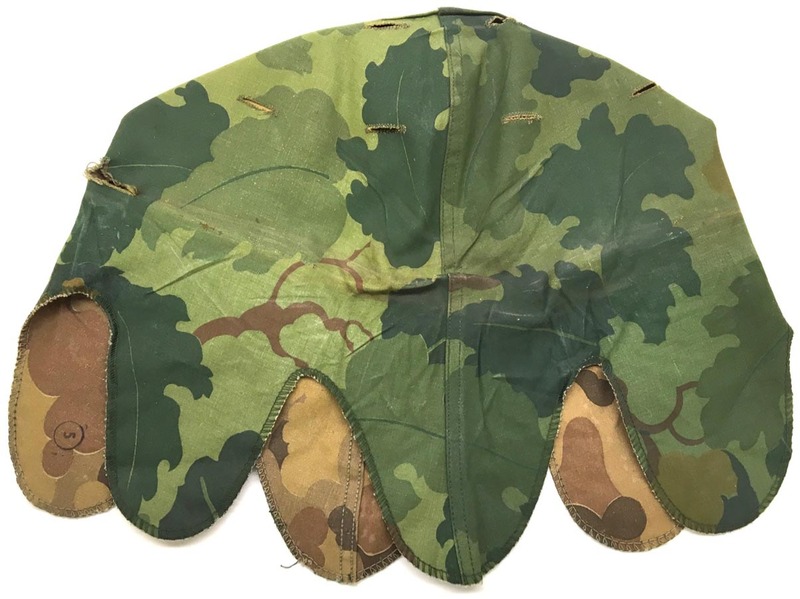 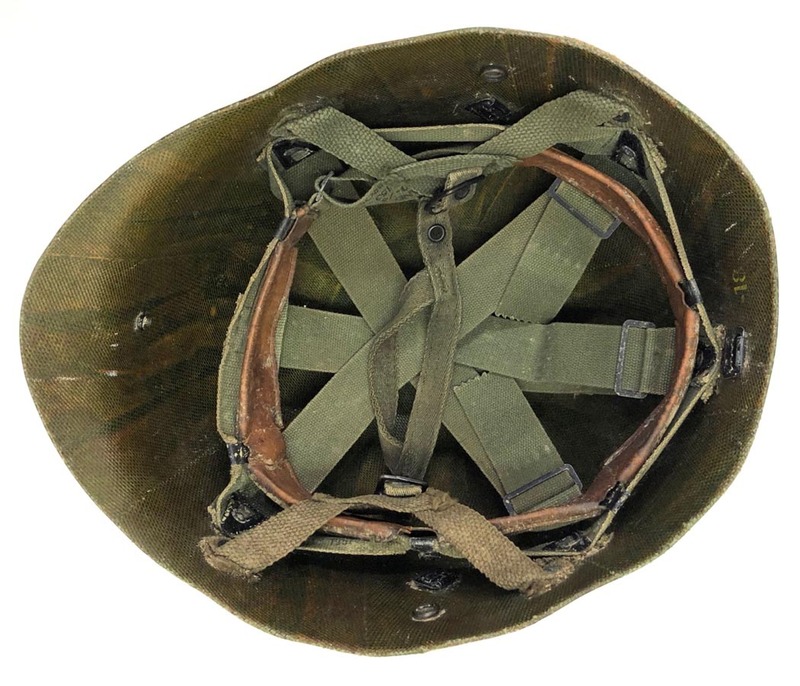 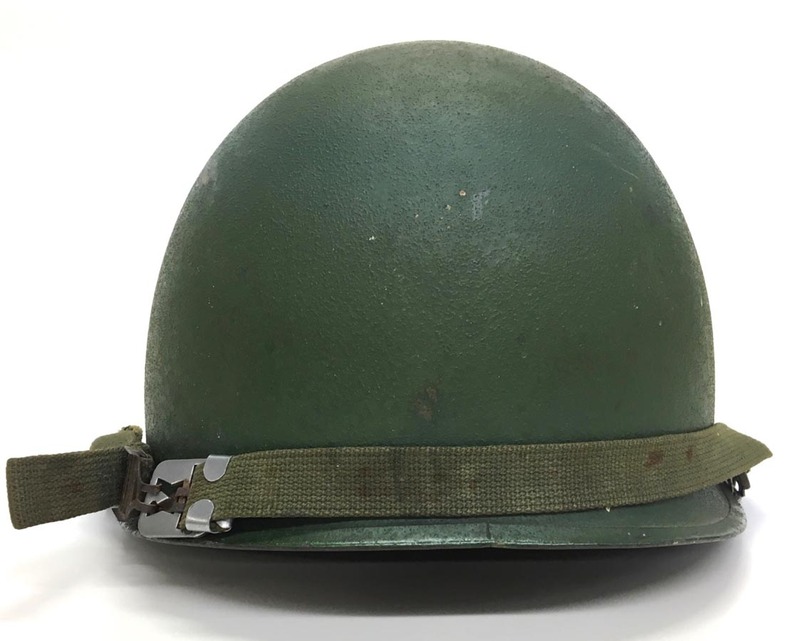 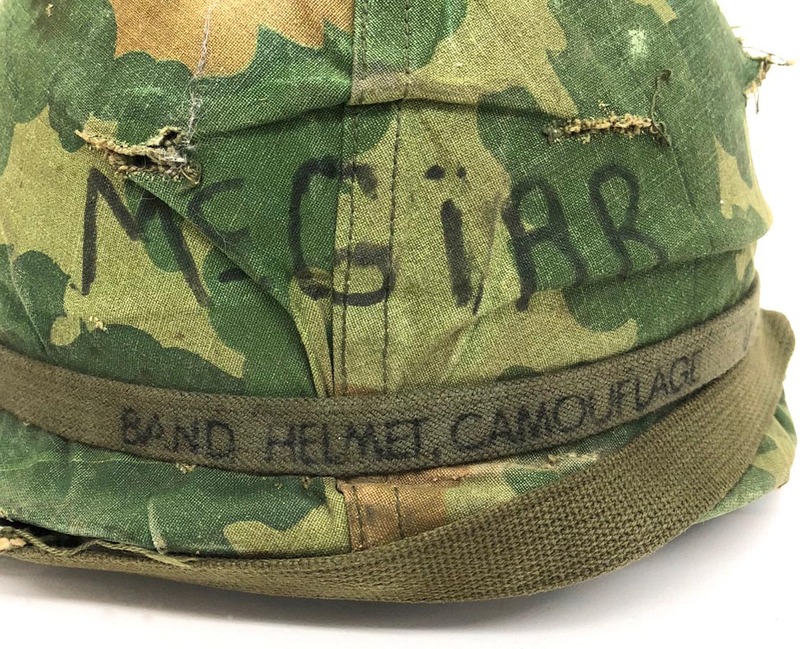 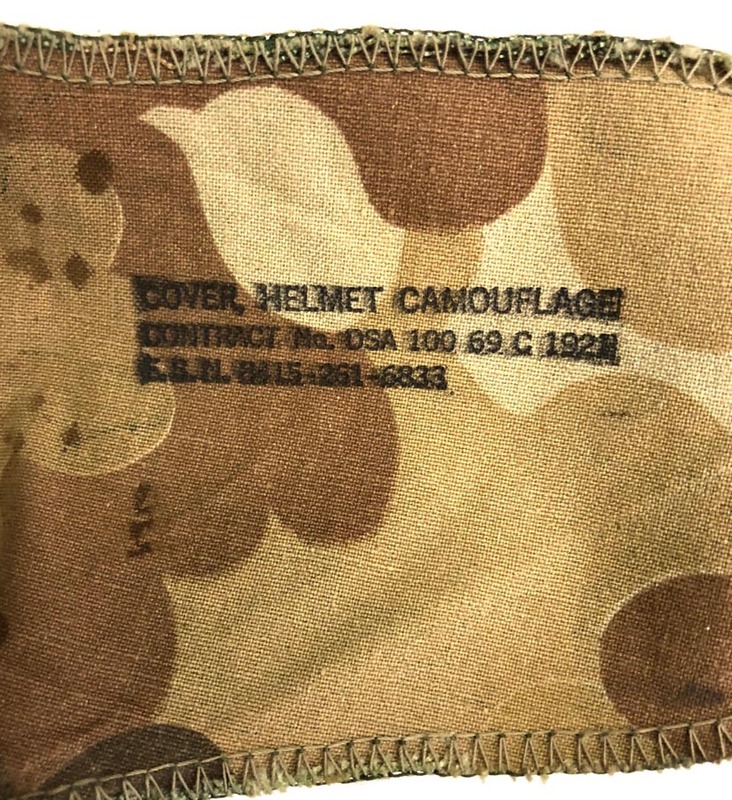 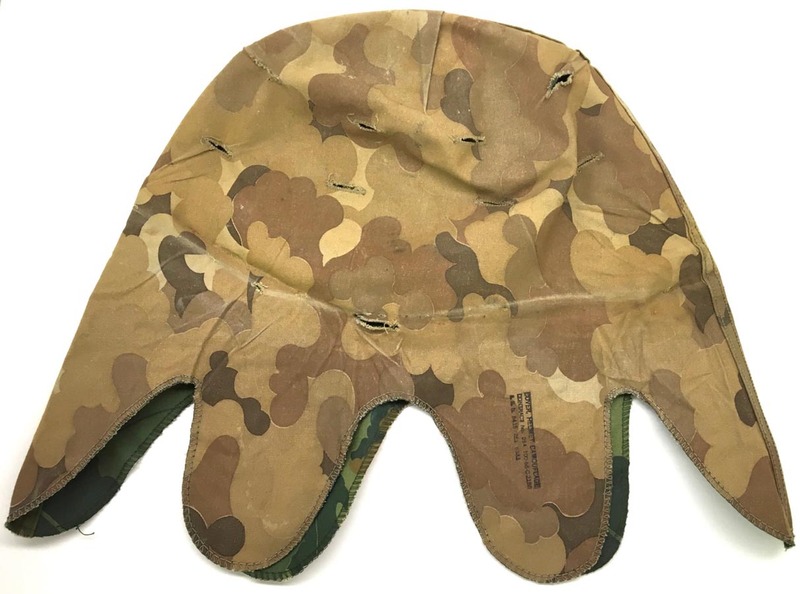 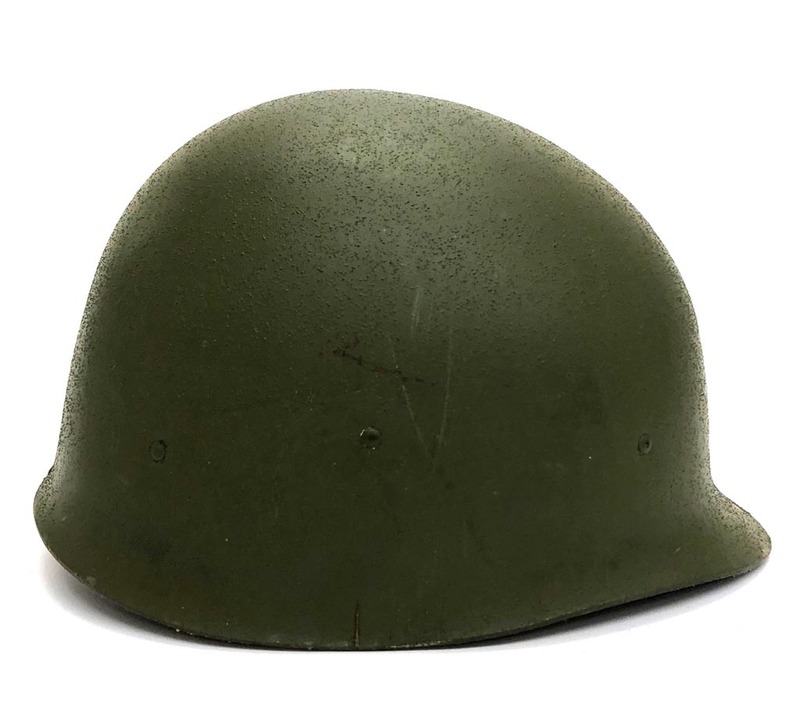 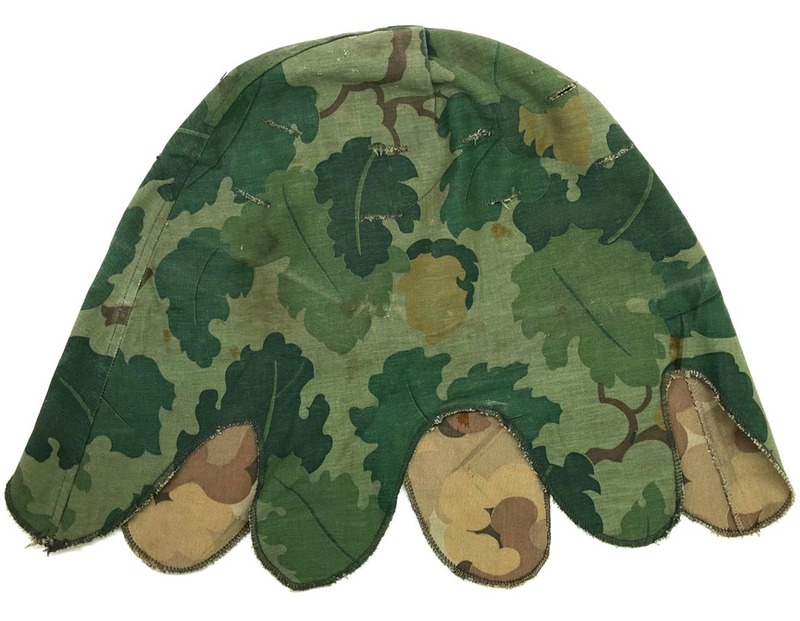 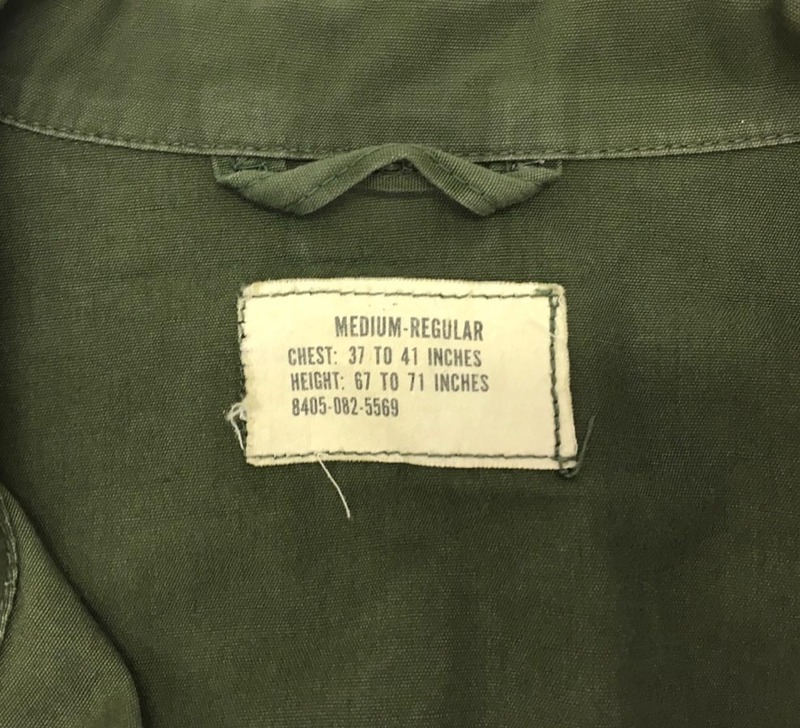 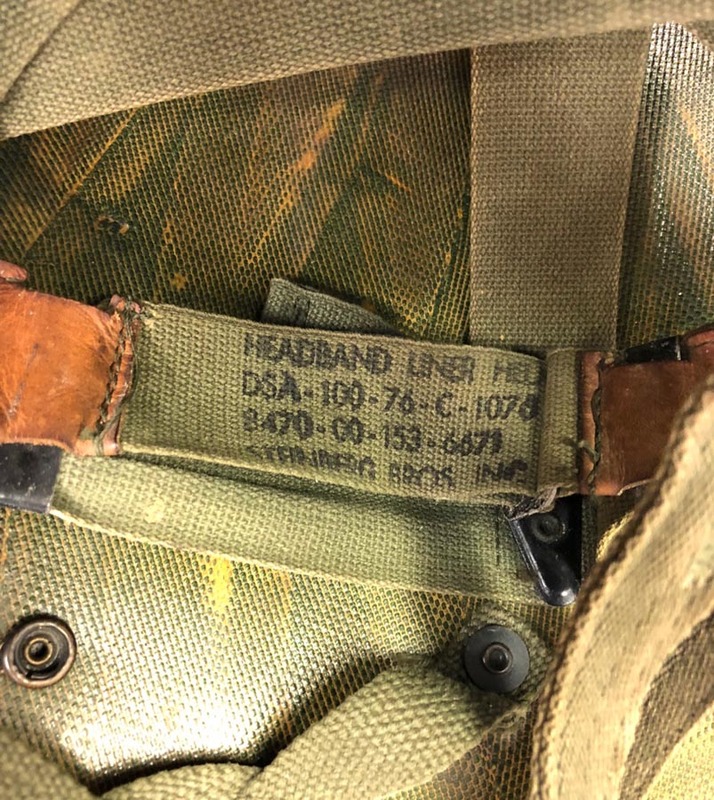 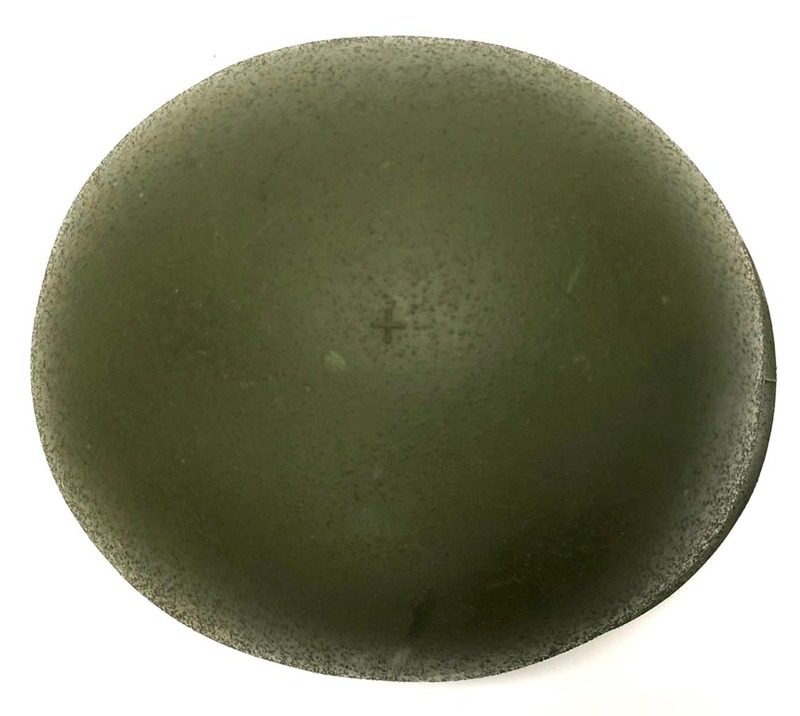 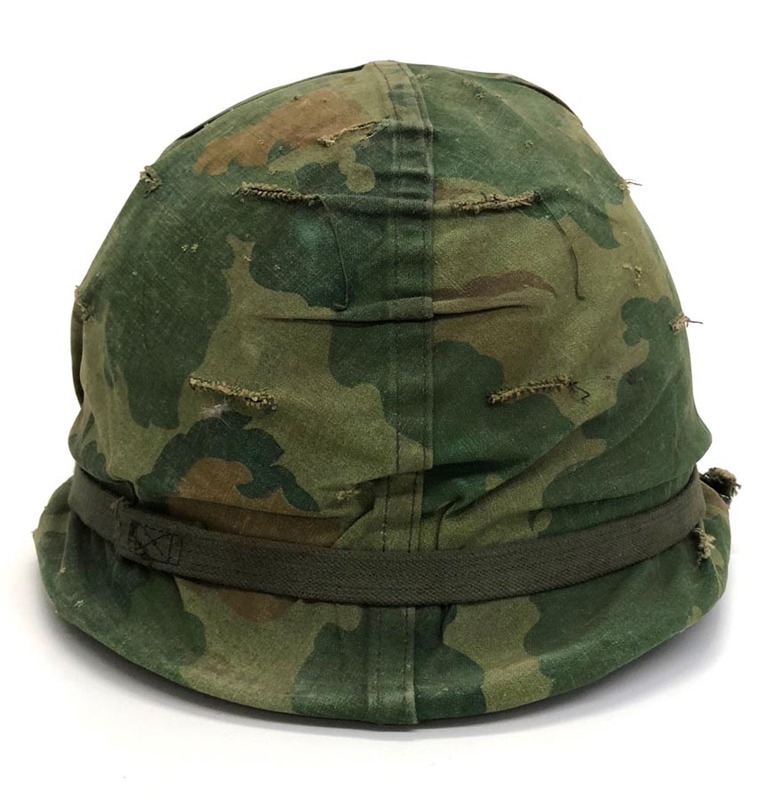 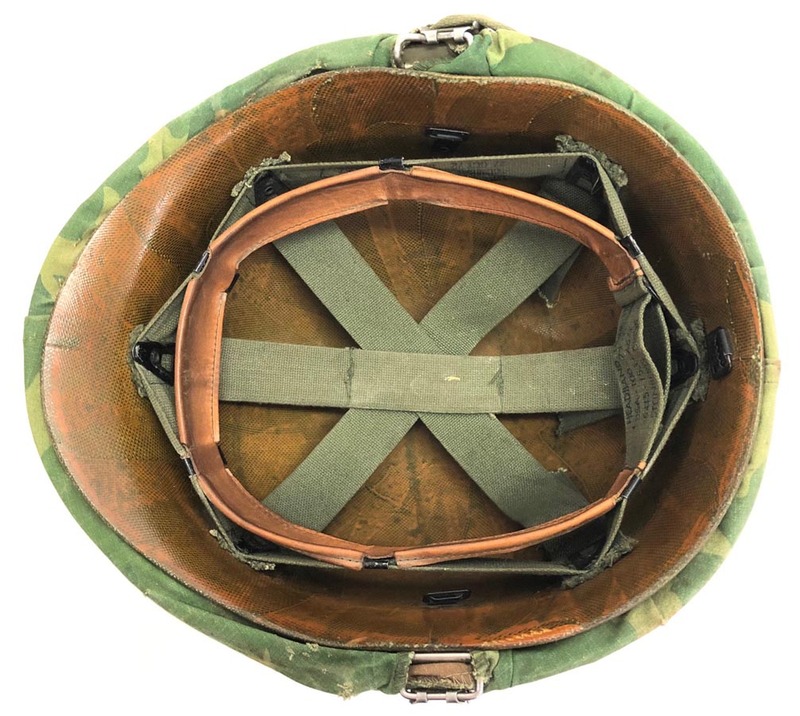 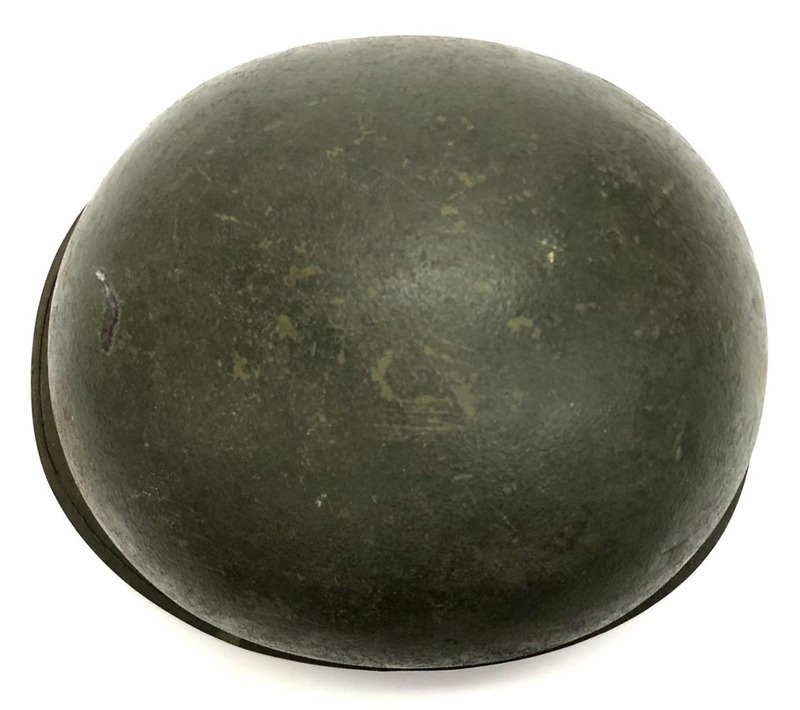 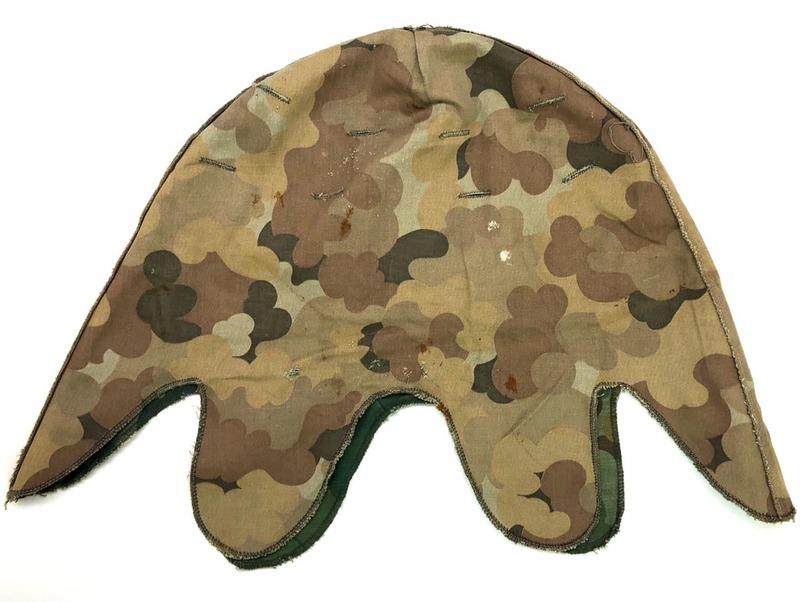 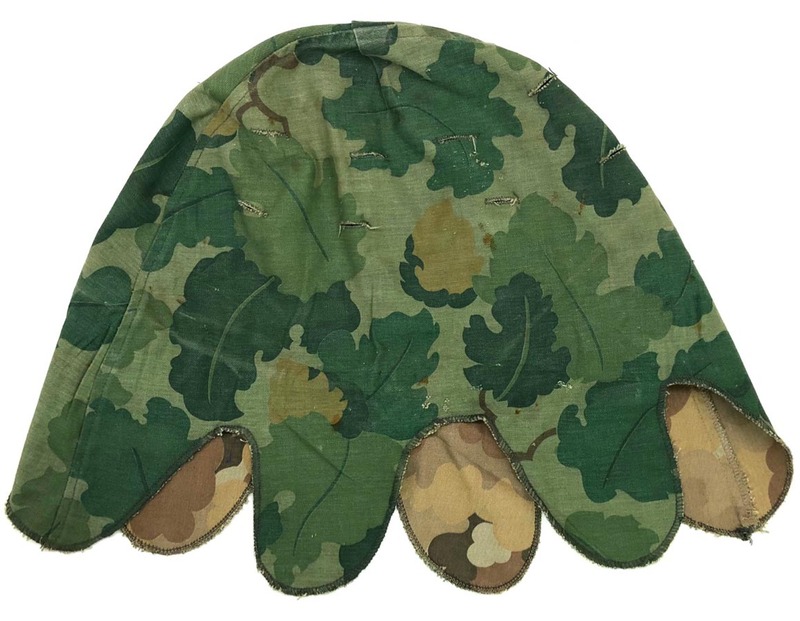 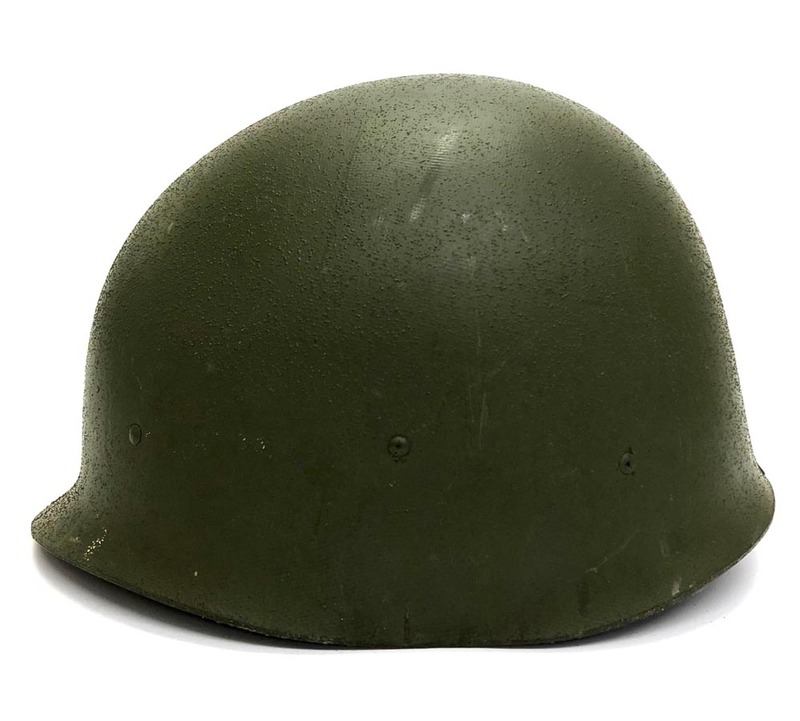 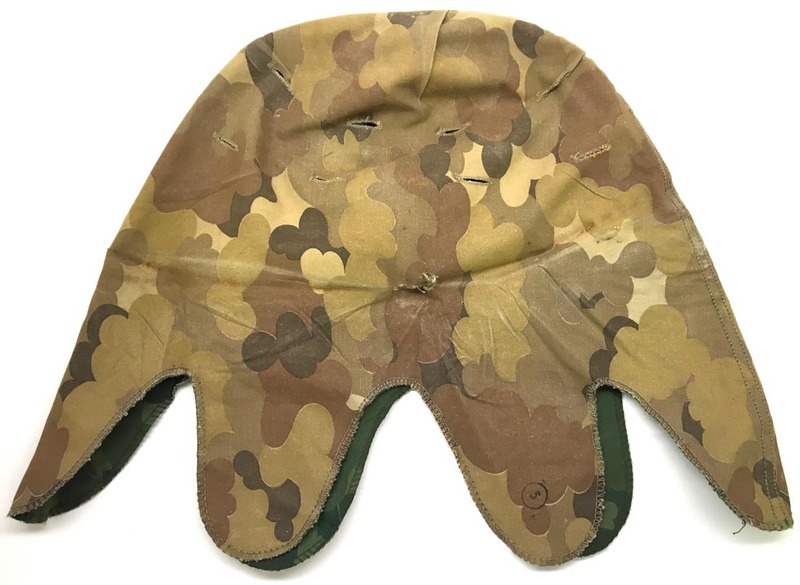 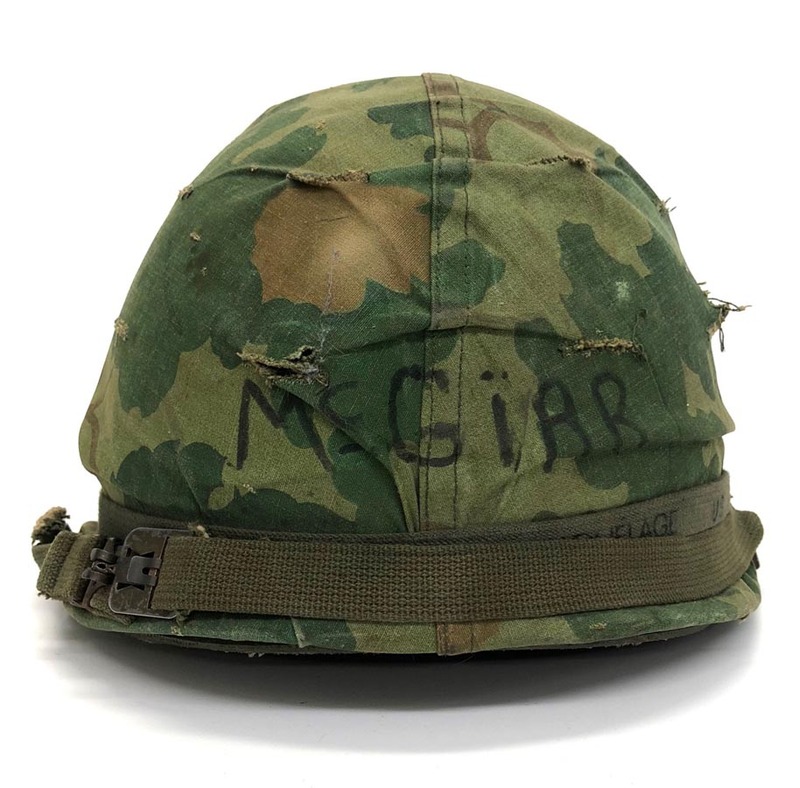 PHYSICAL DESCRIPTION: This Vietnam Era US Mitchell M1 Helmet Cover is in nice condition showing some wear. 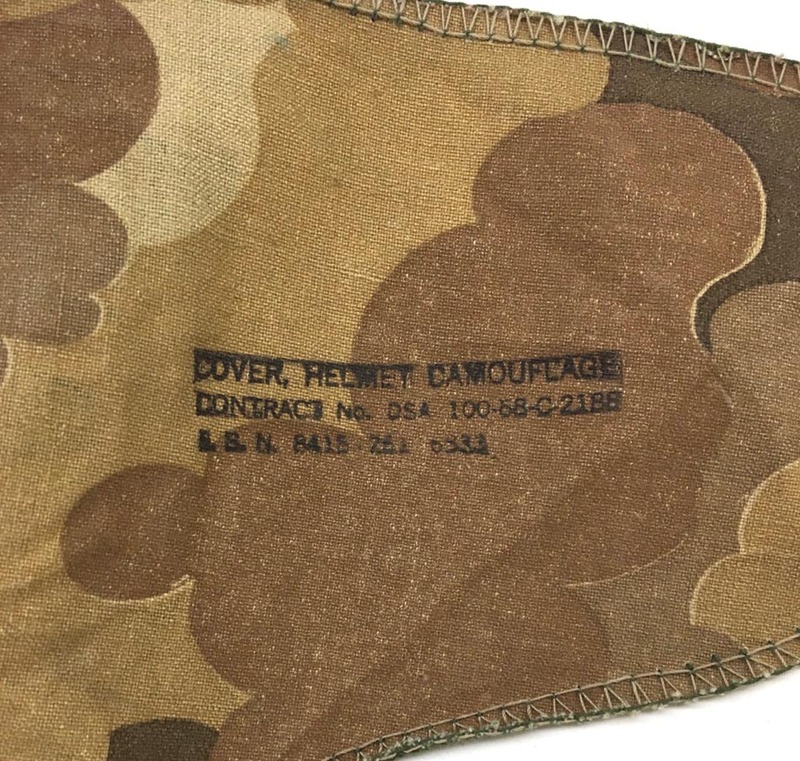 Cover has a few small pinholes and some light staining.